There's so much more to the Costa del Sol than stretches of golden beaches and scorching sunshine. Discover art, culture and top class cuisine in Malaga city, keep the kids entertained in Benalmadena and party til' the early hours in Puerto Banus. Malaga province has so much to offer and there's something to suite everyone. Malaga is a province on Spain's southern coast (Costa del Sol) overlooking the Mediterranean sea and is the second largest city in the region of Andalucia, Seville being the largest. Malaga is famous for many things, the city itself is Pablo Picasso's birth place but Flamenco, Bullfighting as well as a rich and diverse culture have also put Malaga firmly on the map. 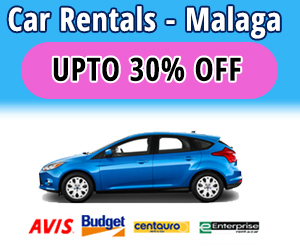 The most well known holiday destinations near Malaga airport are to the West of the city. They include Torremolinos, Benalmadena, Fuengirola, Marbella and Puerto Banus. In my 12 years living in various towns on the Costa del Sol I have gained lots of experience and knowledge of the local area. Below I have written an extensive guide (updated for 2018) on how to best enjoy each of these 5 fantastic Malaga resorts and why at least one of them is perfectly suited for your next holiday. Malaga, once overlooked as a holiday destination with tourists favoring nearby resorts, has come a long way in recent years. Now the city offers a fantastic mix of both modern and traditional as well as being one of the best beach resorts in Spain. Arriving in Malaga is easy, located just 8km from the airport the train will take you from the airport into the city centre (Malaga Centro station) in around 15 minutes. Or hop in a taxi, there are always plenty outside the airport waiting to take you where you need to go. Once you arrive in the heart of Malaga the best way to get around the city is on foot…the best way to get around the city is on foot. Make your first stop the famous marbled streets around Calle Larios to see some beautiful architecture, fantastic shops and a great selection of pavement cafes to grab a quick refreshment before moving on. Don't be afraid to venture down some of the side streets too where you will find some individual boutique shops and more intimate little cafe bars offering their great value “menu del Dia” (Menu of the Day). Most cafes will display their daily menu outside on a chalk board and for as little as €8 feast on a traditional Spanish meal of starter, main course and dessert, usually with bread and a glass of wine or beer included. Another great way to get around is by using the city's hop on- hop off bus tour. Grab a seat on the open top deck and see the sights with an uninterrupted view. 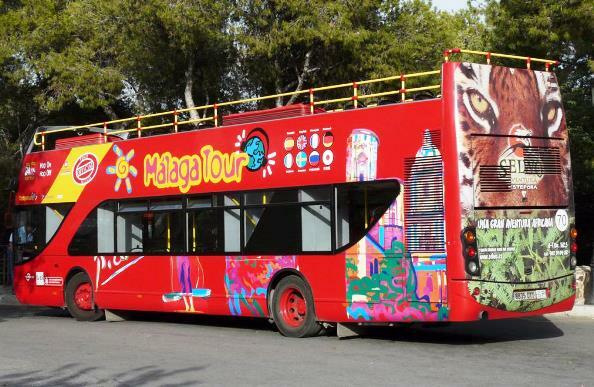 There are two routes, red and green taking you to the best sites Malaga has to offer including the cathedral, pretty streets, museums and beaches all at your own pace. The red route also comes with a handy audio guide giving you lots of useful information about the city and the best thing is, you get off when you want. El Pimpi restaurant, an institution in Malaga, is one of the oldest bars and wine cellars in the city. The bar itself is decorated with hundreds of wine barrels and although the restaurant is most famous for its authentic tapas, you can also sample a glass of traditional sweet Malaga wine. The new marina area of Malaga has been an instant success, cleverly designed with a great selection of restaurants and bars appealing to the many cruise ship passengers that dock here as well as locals. The famous Pompidou art centre is based on the port and now La Noria, Malaga's own version of the London eye great for taking in the views. But to escape the heat and hustle & bustle, head down to one of the cities great beaches. The nearest is La Malagueta which gets quite crowded in summer so if you are looking for somewhere a bit quieter take a stroll along the promenade heading East towards El Palo and enjoy the sight and smell of “Espetos”, sardines grilled over an open wood fire on the beach. 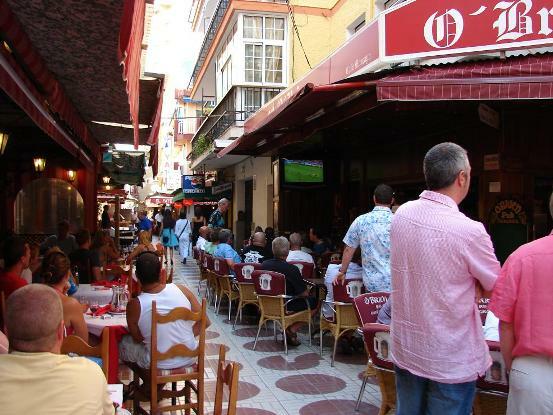 Malaga port now boasts a plethre of boutique bars and restaurants for all tastes..
After dark is when Malaga city really comes to life, the nightlife or ‘La Marcha’ doesn’t really get going until the early hours with clubs going strong until around 6am. Don't worry though, bars and restaurants are still buzzing from early evening with families and couples dining. If its a quiet meal and a few drinks you prefer the city is bursting with places to enjoy all types of cuisine and there are some fantastic roof top bars which are the place to be for sun-downers and great views of the skyline. 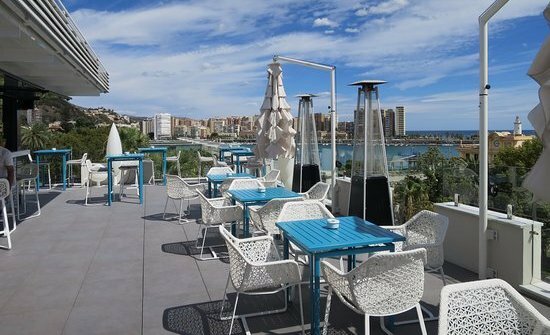 One of Malaga Travel Guide's favourites has to be the rooftop bar at the AC Hotel Malaga Palacio, the views are the best in Malaga, as are the Gin & Tonics! In fact, why not book a room at this lovely city centre hotel and be even closer to the bar. The new Mercado Merced a gourmet food market, located near Plaza de la Merced in the historic centre and a few steps from Picasso's birthplace has been a roaring success since opening late 2015. With 22 stalls showcasing Malaga's developing food scene, the choice is endless and even the pickiest of eaters will find something tempting. The swish new Hotel Room Mate Valeria has got people talking, recently opened for summer 2016. It is in possibly the best location in the city, bang central and within a few minutes walk of the fantastic marina, old town, beach and Malaga Cathedral. It also has a great roof top bar and pool, perfect for escaping the busy city streets below while enjoying a pre or post dinner cocktail. For art lovers, look no further than the museum of Pablo Picasso in the city centre, Malaga was the famous artist’s birthplace and the museum has over 250 pieces of art donated by Picasso’s family members. If Picasso isn't your thing, there are no less than 20 other museums in Malaga. Malaga Cathedral is a must, don't be put off by its €5 entrance fee, it is well worth a visit inside to fully appreciate this ancient Cathedral. There are guided tours (some in English) at certain times of the day to the rooftop and also night visits are available. Just a few minutes walk from the Cathedral in the historic centre stands the impressive Alcazaba Moorish Fortress with fantastic views over the port and city. For little over €2 entrance you can easily spend a morning strolling around the lovely courtyards and gardens admiring the intricate tiles and little water channels imagining what life was like in the 11th century. The Malaga Pass has to be the best and cheapest way to see the best Malaga has to offer. With over 24 of the top tourist attractions, including those mentioned above, as well as discounts on hotels, shops and tourist services this one stop pass priced at just €28 guarantees you free entrance into all listed attractions and no queues! El Pimpi Restaurant – It is one of the oldest bars and wine cellars in the city, the bar itself is decorated with hundreds of wine barrels, fantastic tapas, cocktails, wine, what more could you ask for. Museum of Pablo Picasso – Right in the city centre, Malaga was the famous artist’s birthplace and the museum has over 250 pieces of art donated by Picasso’s family members. Bike tours Malaga offer…well just that, various guided tours of the city including the Malaga wine tasting tour…or just hire a bike from them and go explore. The great thing about Malaga airport is its proximity and ease of access to so many great coastal resorts, Torremolinos being the closest. This well known beach resort was the first real Spanish holiday destination for Brits looking for a bit of sun and sangria way back in the late 1950's. 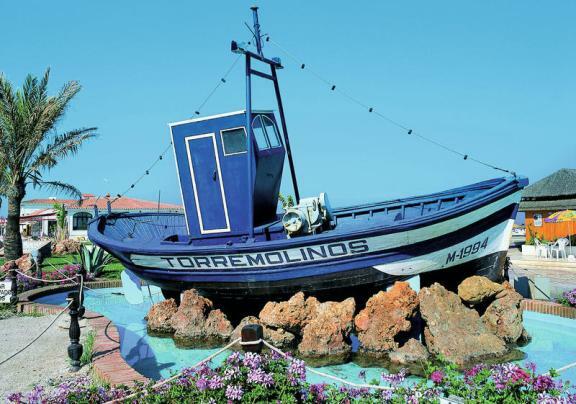 Thankfully Torremolinos has outgrown its spam and Chips image it had become known for as tourists abandoned the resort in favour of nearby Benalmadena and Fuengirola. But Torremolinos has evolved in recent years, now offering upmarket hotels, shopping areas and restaurants to try to appeal to a wider market. Easy to reach, just hop on the train at the airport heading West and in a few minutes you will arrive at Torremolinos train station in the centre of town. The area known as The Carihuela which borders Torremolinos and Benalmadena is a lovely modern area to spend a day or evening. It features a long promenade overlooking a wide, clean sandy beach with lots funky chiringuitos (beach bars) attracting a young crowd in summer looking for a beach party atmosphere. Prices are fantastic too with a refreshing mojito costing around €6 and the best place to enjoy a traditional paella or Espetos (sardines) is one of the many chiringuitos lining the beach front. If shopping is more your thing you're in the right place, The Carihuela has tons of boutique style clothes and shoe shops to tempt you, all at very reasonable prices, you can pick up some designer brands too. The whole beach front is lined with a great selection of hotels, most with direct beach access and large private pools. the Sol Principe Hotel is one such hotel, fantastic prices, options of half board and a great pool scene with loads of entertainment throughout the day and night too. I went ‘undercover' at the brand new Clubhotel Riu Costa del Sol just recently to bring my readers an honest and unbiased review of this huge hotel. It's perfectly located right on Torremolinos beach front and only 10 minutes walk to La Carihuela. Torremolinos offers plenty for the kids to do; spend an adrenaline filled day at Aqualand, the biggest water park in Malaga with kamikaze's, rapids and a great kids zone the little ones will love. Not just for kids though as Aqualand has some seriously scary slides that even the biggest thrill seekers might think twice about. Bateria Park stands high overlooking The Carihuela and the beach, its completely flat with walking and cycle paths around the perimeter, a large kids play area and a man made lake with boating for just €1 for 30 minutes. At the far end overlooking the beach still stands a watch tower with artillery guns and a tunnel the kids will love to explore. The crocodile park is a good place to spend a morning or afternoon if you want to escape the pool or beach. Located next to the Aqua park you can hold a baby croc, see different demonstrations and come face to face with the largest Crocodile in Europe. Plaza Mayor shopping and entertainment complex is a great family day out, hop on the train in the direction of the airport and you'll reach it in under 10 minutes. If you have a hire car just head towards the airport on the N340 motorway and you can't miss it on your left just before you get there. Split into two parts, one side has a cinema, bowling alley tons of restaurants and an entertainment area, open from 10am til 1am. 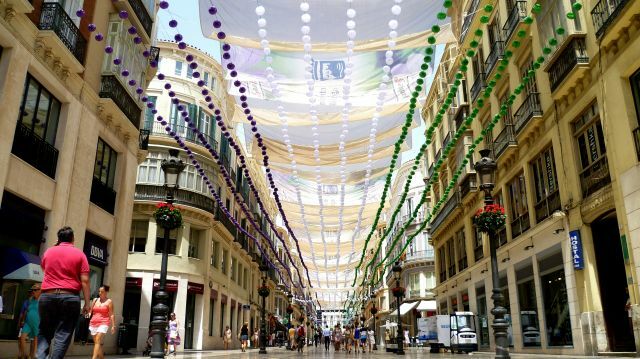 The other side is home to high street shops like Zara, Mango, H&M as well as some great Spanish high street shops like Bershka and Stradavarius as well as Mercadona supermarket all open from 10 til 10 Monday to Saturday. Calle San Miguel – A lovely pedestrian street full of shops, cafes and restaurants, very busy in peak times but wonderfully atmospheric. You can even grab a 2 pint beer! Parque la Bateria – Lovely park with a a bit of history too and no animals allowed so very clean. Aqualand – Huge water park with slides and rides for every age group but beware it can be very busy in August with long queues for slides. Crocodile Park – Not for the feint hearted at feeding times! Benalmadena is the place to go if travelling with children, with loads of great attractions for the whole family you'll never be bored. Take the train from the airport and get off at Arroyo de la Miel station which is the town centre of Benalmadena, the coast is just a 5 minute taxi ride away. One of the best value hotels on this stretch of the coastline is Holiday Village World, my family and I have stayed here loads of times ourselves for a weekend break because it has so much to offer. There's a water park, dedicated toddlers pool and splash area, free kids club, games room, several restaurants and family entertainment, too many things to mention. It's a good choice if you are traveling with kids and teens of different ages as they'll never get bored. For little bit of luxury check out the Vincci Seleccion Aleysa, this boutique hotel and spa is right on the beach and is just 10 minutes walk to the Puerto Marina. The hotel's restaurant and pool are stunning and it actually gets 9.5 stars on booking.com, something which you rarely see. Tivoli world amusement park and cable cars up to the top of the mountain with shows featuring birds of prey are both within walking distance of the station in Arroyo de la Miel. Tivoli world is a medium sized theme park built in the style of a traditional Spanish village. It features lots of rides and roller-coasters for all ages and has a good Chinese restaurant inside which does a great set menu for less than €10 per person. There are various shows throughout the season too, check out the website for opening times as hours vary throughout the season and they only open evenings in summer. Every Friday morning at the Tivoli world car park is a great local market. Beach towels & bags, clothes, shoes, sunglasses, even fresh fruit and veg, just don't forget to barter for a good price. A little bit further but still accessible on foot or a short taxi ride is Selwo Marina conveniently located next to Paloma Park. Selwo is great for all the family, see the penguins at feeding time and make sure you don't miss the main attraction, the fantastic dolphin show to music. For great rates on tickets at Selwo Marina you can book right here using the calendar below. The park re-opens March 2018 and tickets will be avaialable to purchase shortly. Paloma park is one of the nicest areas in Benalmadena away from the high rise hotels, it boasts a huge park with a lake, 3 cafe bars, animals and several play areas for the kids. There's loads of grass, often with rabbits running around and plenty of shade to escape the heat. A great place to enjoy an after dinner drink and a stroll while watching the kids play on a summers evening. Sea Life centre located in Benalmadena’s award winning Puerto Marina will keep the kids entertained for a few hours, get up close and personal with sharks and stingray in the underwater tunnel. Afterwards spend the day or evening exploring the marina, there are lots of boat trip on offer, some include BBQ and free bar for a fixed price, and if you're lucky you might even spot some dolphins. You can walk along the Paseo on an evening and the choice of restaurants and bars is endless but make sure you spend at least an evening exploring Puerto Marina. The marina is especially lovely at night, bustling with people and beautifully lit, the best place to enjoy it is in one of the restaurants on the upper level with panoramic views over the port. Angus Steak house is particularly good. There are lots of bars and shops too and also an amusement park just behind the Marina with plenty rides for the kids to enjoy. You can't visit Benalmadena without spending an evening in the Pueblo, a traditional Spanish village with fantastic views over Fuengirola and Benalmadena. Catch a bus from the coast road and meander through the quaint little white washed streets, many of which are closed to traffic. Have a bite to eat in one of the restaurants overlooking the La Niña fountain in the pretty Plaza de España. Afterwards take a short stroll up to the beautiful Santa Domingo church where the views over the Costa are second to none. If you have spent most of your holiday on the coast, the Pueblo will feel like a welcome break, it has a much more laid back and tranquil feel to it. In August the village comes alive in the evenings when it is transformed into a fantastic Arabic market. Belly dancers will entertain you with their rhythmic moves and enchanting music, sample traditional Arabic street food and of course a Mojito, there's even rides for the kids. 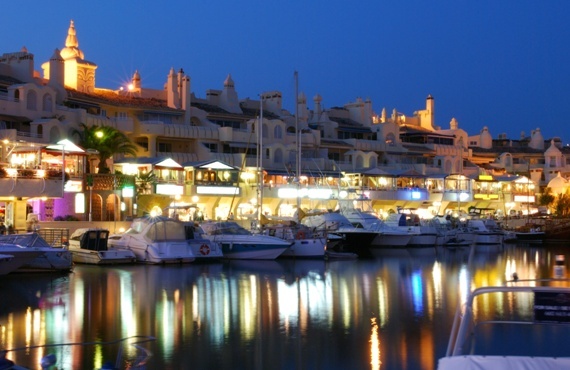 Benalmadena Marina – This award winning marina is a must see, stroll around it day or night, have a bite to eat or take one of the boat trips on offer, some fabulous restaurants on the upper level with the best views over the marina. Weekly Market – Every Friday from 10 til 2 there is a huge market located at the Tivoli World car park, you can buy everything from toys, clothes, bags, Spanish pottery and textiles, flowers and an excellent range of fresh fruit & veg too. Sea Life Aquarium – Located in Benalmadena Marina, this is a great way to escape the heat whilst getting up close to some amazing sea creatures; watch shark feeding, hold a crab and walk through the fascinating under water tunnel. The town of Fuengirola has been attracting tourists since the 1960’s with around 25% of the population from other European countries. Fuengirola is the last stop on the train from Malaga airport, It boasts 8km of fantastic wide beach along a promenade littered with chiringuitos specialising in fantastic fresh seafood. You will be spoilt for choice for places to eat and drink as you walk along the main drag in Fuengirola, with Indian, Chinese, Thai, Lebanese and of course traditional Spanish among others. The selection is quite overwhelming and because there is so much choice you will find the prices are exceptionally low with many bars offering a tea, coffee, wine or beer for just 1 euro! Hotel Las Palmeras is right in the heart of things. Opposite the beach, a few minutes walk to the marina and hundreds of bars and restaurants right on your doorstep. There's a good sized swimming pool and the restaurant gets excellent reviews. 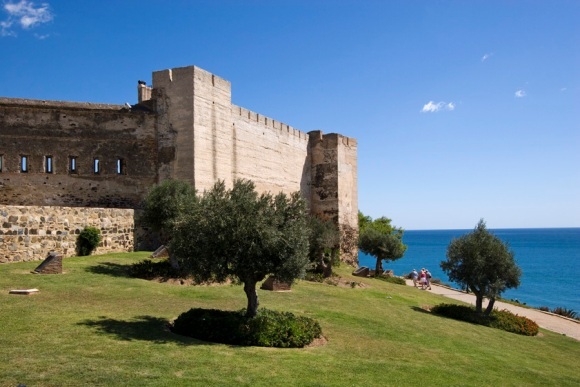 Sohail Castle towers over the beach to the far West of Fuengirola and was an old Arabic ruin until renovations began in 2000; the castle now hosts music concerts and festivals throughout the summer months. It is open all year round to tourists and for a small fee you can walk up the windy path to the top and have a peek inside. 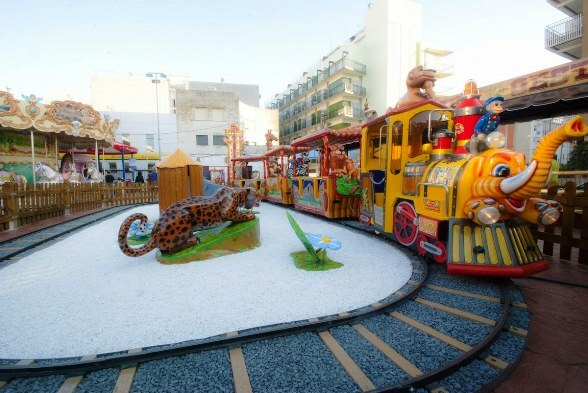 The port area in Fuengirola area while not as flash as Malaga or Benalmadena is home to a new outdoor children's mini theme park. Aimed at kids under 10, Sould Park is free entry and once inside you buy a card and simply top it up with money for the rides, there's a good cafe bar in the park too and drinks are very reasonably priced. Fuengirola has its own water park on the outskirts of town, its not as big as the one in Torremolinos but its a little cheaper and has a very good play area for younger kids, check their websites for offers and family passes. One of the best attractions is the Bio parc, formerly known as Fuengirola Zoo, it's very well kept and the scenery is beautiful, designed to mimic a rain forest, most importantly the animals always look happy and well cared for. There's different exhibitions throughout the day a good cafe and in summer months they open in the evenings. To save money on your Bioparc tickets, book using the calendar below, cheaper than paying at the door when you get there and save time queuing. Just behind the castle is Mirimar shopping centre, complete with aircon, a cinema (some English movies), a food court, large supermarket and great high street shops including Primark, all open 10am til 10pm Monday to Saturday! From the castle you can walk to it in less than 10 minutes, or take a taxi for a couple of euros and stock up on your holiday wardrobe essentials. Get your bargaining head on because every Tuesday from 10am til 2pm Fuengirola has a great local market. On the feria ground in the Los Boliches end of the paseo the market is the place to go for just about everything and anything. Pick up some lovely local handicrafts, fresh fruit and veg, clothes, bags, sunglasses, shoes, hats, and pashminas from just €2 each. For some much needed couple time book in a babysitter and get down to one of the best bars in Fuengirola, Speakeasy Jazz club. If you like jazz, or even just good live music and THE best cocktails around then this is the place to go. It opens from 10pm until around 2am and is the most unique place in Fuengirola with different acts on every night, the theme of the bar mimics a typical jazz bar during the prohibition era, right down to the uniforms of the bar staff. They specialise in gin cocktails and put their own spin on everything, some are served in tea cups, others in mason jars, either way…delicious! The area known as “Fish alley” can be found just one street behind the main road running along the beach, right behind the recently renovated Hotel El Puerto. You can't miss it because the hotel features two 'round' high rise buildings and is around 100 metres from the marina. If you get lost, just ask a local. Fish alley is almost like a little village within Fuengirola, the narrow streets are full of restaurants with tables spilling out onto the pavements, so much so that you don't really know where one restaurant starts and the other ends. There is no traffic in fish alley so its very safe and is always buzzing, especially in high season. I recommend Aroma Restaurant for good steaks and seafood and Moochers Jazz Cafe for the most amazing pancakes and good live entertainment. Fish alley also has a new food market, “La Galeria”, based on the same concept as the previously mentioned Mercado Merced in Malaga. Good for relaxed dining in a bustling atmosphere, grab your table and then browse the various food stalls on offer and see what takes your fancy. Sohail Castle – Towers over the beach to the far West of Fuengirola and was an old Arabic ruin until renovations began in 2000; the castle now hosts music concerts and festivals throughout the summer months. It is open all year round to tourists and for a small fee you can meander up the windy path to the top and have a peek inside. Paddle Surf – Experience the latest fitness craze, ‘paddle surfing’ at Carvajal beach (opposite end to the castle), hire a board or take a lesson for around 15 Euros. Speakeasy Jazz club – Absolutely the best live jazz and cocktails for miles around, located under the Las Rampas hotel; replicating the classic bars of the prohibition era, a must visit! Visit the huge outdoor market, every Tuesday morning on the feria ground. Marbella and Puerto Banus are not accessible by train; a taxi from the airport will set you back around 50 Euros, alternatively there's a bus service from the airport. For larger groups, the fastest and most cost effective way to get to your destination is private hire minibus. These two neighbouring resorts are still best known as “the playground for the rich and famous”, with many high profile celebrities and billionaires owning holiday homes here; and of course the cast of TOWIE who come back year after year. Puerto Banus attracts party goers all summer long, with great beach and pool parties in full flow from mid May to the end of September. If champagne spray parties and all day drinking is your thing, there's plenty of options to flaunt your best bikini bod; Ocean Club, Plaza Beach and Nikki Beach to name a few. They don't come cheap though, prepare to splash the cash as well as the champers with a Super VIP bed (for 14 people) on August bank holiday 2017 costing a whopping €7950 at Ocean Club. While others are a bit more affordable at €200 which including a bottle of Dom Perignon. Puerto Banus harbour is home to some of the most exclusive yachts and sports cars you are likely to see in one place. The super yachts, at least a few of which are owned by the Saudi Arabian royal family are moored here all year and come with a full team of body guards and chefs. The port has an impressive front line packed with designer boutiques like Prada and Gucci where you could easily blow your total holiday budget in a couple of hours. As you would expect there are bars, clubs and restaurants aplenty, some with impressive roof top bars like Pangea for late night drinks under the stars. Its not all catering for the rich and famous though, go one row back to the second line and you'll find the likes of Linekars bar and plenty others where drinks are much more within budget. Keep your eyes peeled and you might spot a celebrity enjoying a night out in one of the front line bars after dark. Marbella is slightly more low-key and definitely more grown up than Puerto Banus, however it still has its share of swanky bars and clubs. Head to Marbella's port after dark, smaller than Banus but lots prefer it, me included. Lemmon is a great bar/club and really gets going after midnight with live DJ and live saxophonist weekend nights. Marbella is much more versatile than Banus as it appeals as a great family destination too with a wonderful long promenade with literally hundreds of restaurants and bars offering all types of food. There are children’s play areas scattered all along the beach and restaurants are very accommodating for families. Accommodation in Marbella ranges from basic and and reasonably priced 2 star hotels to stunning boutique hideaways. It doesn't get more luxury than the amazing Puente Romano hotel, where you'd be lucky to get change from €1000 for a nights stay in peak summer. Some say its not worth the money but believe me the attention to every detail is second to none here it really is a fantastic resort ever changing to keep up with demand. Nobu restaurant has just announced it is opening in the hotel grounds in May 2017. For the ultimate party hotel look no further than Sisu boutique Hotel in puerto Banus. This hotel never sleeps, just look at the reviews it gets! If you want see and be seen and party with the best of them then stay at Sisu. New for 2018 the beautiful Nobu Hotel Marbella is by far the number 1 choice for couples and singles to spend a luxury holiday. This hotel is second to none in terms of luxury, service, ambiance, food, you name it they've got it. 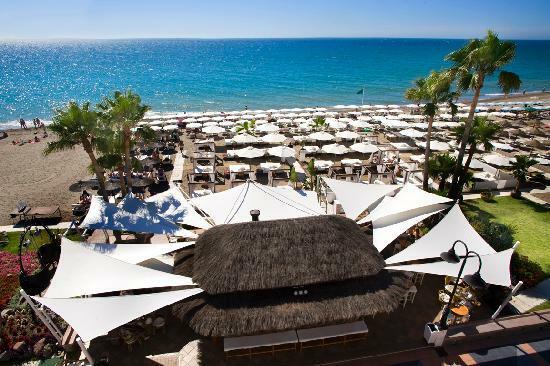 Nobu is in the best location within the grounds of the gorgeous Puento Romano Hotel on Marbella's sea front. If you want to impress someone special, Nobu is absolutely the place to bring them, just read the reviews! As mentioned Marbella has a lovely port area where you can sip a delicious cocktail on one of the terraces by day and watch it come to life as night falls. Just a five minute walk from the port and you'll reach the old town although it seems a million miles away from the towering hotels lining the coast. The rustic buildings around Orange Tree Square, named as there are literally hundreds of orange trees providing much needed shade for diners in the heat of the day. Little shops litter the cobbled streets among the white washed houses, closed to traffic so ideal for a stroll after dinner when the shops re-open after siesta time or take in an authentic Flamenco show with dinner at Flamenco Ana Maria. Some of the best restaurants can be found away from the main square tucked away in the narrow side streets so take your time reading menus and selecting one that takes your fancy. Banus has an impressive selection of designer shops along its front line. The last time I checked, the Cartier shop had a pair of Aviator sunglasses priced at €2,500, no wonder they have doormen marking the entrance! For all your high street needs, look no further than La Canada indoor shopping mall just a few km from Marbella town centre. This place is my guilty pleasure, there's so many fab high street clothes, shoes and cosmetic shops under one roof. You can even shop at Hollister, Top Shop and good old Marks & Spencer, then grab a Costa Coffee before you leave. Flamenco Ana Maria – The place to see authentic Spanish folklore at its best, the atmosphere is perfect, very dark and moody and the dancers, singers and guitarists give it their all. Located in the old town (Casco Antigua), shows at 11pm and includes tapas and wine, an unforgettable experience. Beach clubs – You can’t come to Marbella/Banus and not go to one of the famous day clubs, Nikki Beach, ocean Club and Puro Beach to name a few; even if you haven’t got a few thousand to squander on spraying your mates with bottles of ‘Dom Pom’, go anyway to see what it’s all about. Take in the mesmerizing sites of Puerto Banus. 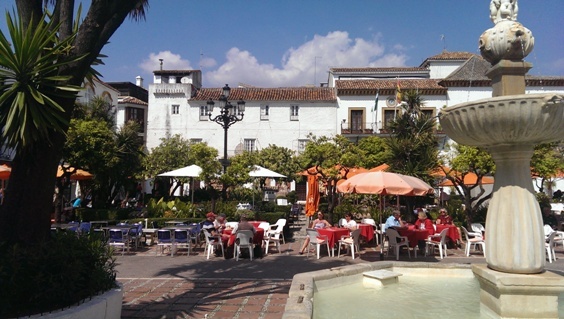 Marbella Old Town (Casco Antiguo) – Really can’t stress enough about how the old town is an absolute must see. It is a beautiful Andalucian village just a few minutes walk from Marbella port. Fantastic shops, a mix of traditional and modern restaurants and quaint little cobbled streets to explore. Shopping in Banus take a backup credit card! 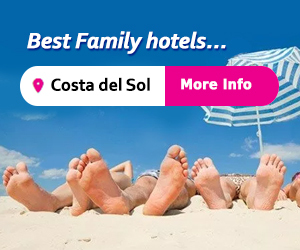 There you have it, some of the best resorts the Costa del Sol has to offer and the warm Mediterranean climate means that this is an ideal year round tourist destination. The close proximity of all of the holiday resorts to Malaga airport is a great incentive and with flights of under 3 hours from the UK…what more can you ask for. Did you enjoy this post? Please Tweet it and share it on Facebook. If you have visited any of these resorts let me know your thoughts by leaving a comment below! Hi Anna this was very informative been going to benalmadena for over 20yrs got friends there lily langtrys at the bottom of cardiac hill are good friends there is so much to do there I never get bored of it be there in may of 2015 Thanks for the info although been to every resort u mentioned but still it’s very helpful thank you!!! Glad you still found it informative even though you sound quite an expert on Benalmadena yourself, wow 20 years, you must have seen a lot of changes! Anything you can add that you like to do when you visit that I missed would be great. Thanks for the comments Barry and enjoy your holiday when you come in May, it’s one of my favorite months here, just before the summer season really kicks in. Hi Louise, I mentioned the most popular resorts when flying into Malaga which as you say get quite busy especially in summer months. If you were to head East of Malaga to the Axarquia area, there are much less crowded and built up resorts along the coast such as Torre del Mar and Torrox, in general accommodation as well as the cost of food and drink tends to be cheaper East of Malaga too. Nerja is a personal favorite of mine but does get very busy in high season. Thanks for your comment. Hi Corinne. Oh how lovely, a double celebration and Marbella/Banus is a great choice of location to celebrate. As I’m writing this, I’m mentally walking along Marbella’s main promenade and picking out all the affordable but nice places you could go for cocktails, tapas, restaurants etc in my head. There are loads and despite the reputation Marbs has, there are tons of places you could go that won’t break the bank. Where are you actually staying in Marbella or Puerto Banus? There’s a short taxi ride between the two so if you could give me a bit more info on location of your hotel, I can help you further. Bluebay is in a great location to the port and lots of nice beach clubs in Banus as I’m sure you know. Only thing is, most of the beach clubs (Ocean club,plaza beach), La Sala by the sea etc) don’t officially open until the last weekend in April. 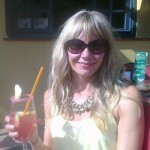 Having said that there are still lots of nice places you can go for drinks and dinner in Banus. Astral cocktail bar is unique & does some amazing cocktails, Black & White is a nice restaurant, Picassos is a good pizza/pasta place and has 30% discount between 4.30 & 7.30pm I think. Along Marbella promenade you should try & stop off at The Boardwalk (close to the port) the decor is beautiful, as are the cocktails & they do a €5 lunch menu every day. Theres a huge tapas restaurant right at the entrance to Marbella port which does €1 tapas, its always busy & has a good buzz about it. Marbella old town is lovely, great boutique shops & lovely to have lunch or drinks, be aware of siesta time in shops though. I could go on, if you wander about especially along Marbella’s promenade you’ll find lots of places advertise specials on food & drinks and Marbella is generally better value than Puerto Banus for most things. Hi Dorothy, thanks for taking the time to comment, lad you found my blog informative. My sister came to visit with her 15 year old son recently and i had the same task, planning things we could all enjoy. To be honest, there’s things all along the coast that would suit, do you plan on hiring a car and traveling or do you prefer to go to a resort and stay there? Benalmadena is a good option, there’s Tivoli world, a good amusement park which generally opens evenings in summer, nice for all of you to wander round, have a bit to eat and your son can enjoy the rides. Also in Benalmadena is the Sea Life Centre and Selwo Marina, you can take boat trips from Puerto Marina, there’s a good choice of different trips on offer down at the port. Fuengirola and Torremolinos both have water parks, Torremolinos water park is bigger and better. Fuengirola also has a great Bio park (zoo) which is a nice day out, in summer there’s shows on an evening too. A bit further along the coast at Elviria is Aventura Amazonia, its fab for kids your sons age, its an outdoor adventure park with zip wires etc, http://www.aventura-amazonia.com/. Also in Elviria there’s an aqua park out at sea from June to September, great fun. Hope this helps a little, if you need any more specific info about any resorts,please let me know. We are thinking of Costa del sol but don’t know which resort? We are mid forties with a 17yr old daughter. We love to walk round shops on promenade and eating and stopping for a drink. In the evenings we love to listen to live music in bars and go from bar to bar. Which do you think would be the best resort? As mentioned in the post, really any f the resorts i think would suit your family. Marbella or Fuengirola for me being the obvious choice with lots of bars, promenade, beach and music bars. Here is a link to hotels in marbella you may find useful, please consider using my ink if you do book as it helps fund my blog and all of the free information i provide to readers. we’re planning on flying to Malaga in July/August- family of 5 including 3 kids, aged 1yr to 6yrs old. Can you recommend any nice villages/ resorts along the coast that are suitable for a family? We’d like a self-catering apartment but we’re not into the loud, bar vibe. Nice sandy beaches for building sandcastles and some reasonably priced restaurants would be great. Hi Mary. Thanks for your question. There are loads of resorts great for kids. Benalmadena is probably the first one that comes to mind simply because it offers so much for the whole family. There’s a long flat paseo right on the beach lined with restaurants and low key bars, nothing too expensive in Benalmadena too. Theres a lovely Marina where you can take the kids on a boat trip, have an afternoon out of the heat at Sea life centre, play mini golf or just have a bite to eat watching the boats come and go. Benalmadena has a fantastic huge park (Paloma park) with 3 cafe bars, a lake and several play areas, nice on an evening after dinner for all the family. You can find lots of apartments for rent around the park area too and your only 5 mins walk to the beach. La Cala de mijas is a little further along the coast, rather than being a long stretch, La Cala is centred around a village with lots of shops and low key bars and some very nice restaurants. It has a lovely beach and a new wooden walkway where you can access many other quiet parts of the beach with lots of chiringuitos to grab a nice paella or a cool drink. To the other side of Malaga is Nerja, a beautiful Spanish village built on a cliff with stunning views and some great little coves. Nerja has a maze of streets full bustling at night full of places to eat and drink and burriana beach is the best place to spend days building sand castles. Hope this helps a little, let me know what you decide and please pm me if you need any more info. Great blog. Myself and my girlfriend have a wedding in San Jose the end of September.. We would like to make a holiday of it. We are both 27, we would like a nice lively resort (we won’t really be night clubbing), but a busy resort with a variety of things to do.. We would be flying in to Malaga airport, plan would be to go to the wedding for 2 nites and then go to a resort for the rest of the holiday.. Wat would u recommend? Thanks a mill..
Hi Ben, thanks for your comment. Great time of year to visit this area of Spain and why not make a holiday of it. As you are flying in and out of Malaga you have loads of options for the remainder of your stay. Nerja is a lovely resort about 2 hours from San Jose, heading back towards Malaga. Its a really pretty Spanish town built on a cliff edge so offers stunning views and a dramatic coast line with lots of coves and sandy beaches. The town is packed with restaurants, bars and shops and there’s always something interesting around every corner. The Nerja caves are really interesting and you can spend a nice afternoon walking the Rio chillar which is a mountain river walk. Hi there, really appreciating your recommendations here. I’m walking the Camino from Astorga to Santiago de Compostela (leaving Australia in a few days.) it’s my first time to Europe! Malaga has been suggested to me for a rest at the end of the long walk (first week of July) and to soak up the sun. I’m travelling solo and would like to stay centrally beside the beach, hopefully with a pool and some great cafes/bars within walking distance. As I’m mid 40’s (and my kids are grown up) I’m not looking for a family resort, though am fine with kids. Hi Jenn, wow what a fantastic way to see a beautiful part of Europe, I have always wanted to do the Camino, many people walk this route solo, its very safe and you’ll meet lots of people on along the way I’m sure. For your (well deserved) rest at the end of a very long walk you can’t beat Malaga itself. Of course I’m a little bias as I live here ;). You can fly direct from Santiago to Malaga in around 1.5 hours and from the airport you can take the train into the city, its very easy. As I’m sure you have read in the post, Malaga is great because its a relatively small city for example you could have a morning coffee on the marina, spend the afternoon on the beach and have dinner in the old town on the evening, all do-able in a day foot. Temps are in the high 20’s at least in July so the beach or pool is your best option during the hot summer days. Most of the hotels have a pool, the city centre ones are usually rooftop with bar for a cocktail watching the sunset. Molina Lario is my personal favourite hotel in Malaga, I also like the AC marriot and the Vincci posada, all have rooftop pools and great bars too and rooms are very comfortable, which is what you want after several days hiking, The Marriot is the closest to the beach. Depending on how many days you plan to stay, malaga is a good base for seeing more of southern spain either by coach or train although you are best off sticking to coastal resorts in July as in land places like Seviile or cordoba will just be too hot for sight seeing. See one of my other comments about Nerja, just 30 minutes or so from Malaga and accessible by bus. At the opposite end of the country in Northern Spain,and a little closer to Santiago is Bilbao. Very different to Malaga and the costa del Sol. Temps even in july only really reach as high as 24 degrees in the Basque region with most days averaging at 20, still warm enough for sunbathing and swimming. The food in Bilbao is to die for, the city is known for its michelin star restaurants and has become a bit of a food haven in recent years. Obviously I don’t know this part of Spain as well as Malaga at all, just thought i’d mention it as another option for you as you will be in Northern Spain for the Camino…. I hope this helps a little, if you need any further info, please don’t hesitate to ask, good luck on your walk! I’m getting married on 29th August 2016, can’t really afford a honeymoon but noticed you mentioned Fuengirola was best for a bargain break. I’m 48 my partner 51. Any suggestions? Hi Sue. Thanks for reading the post and congratulations on your upcoming wedding! Yes, Fuengirola is a great resort for a bargain break, there’s lots of reasonably priced hotels and as mentioned in the post, loads of cheap places for a drink or a meal along the paseo, I mean where else can you get a €1 glass of wine! You might be better off booking a package type holiday through someone like icelolly.com to get the best deal as opposed to booking flights and accommodation separately. If you come early September just after your wedding you are still guaranteed fantastic weather but prices are not as high as they are in August, September is one of my favourite months actually. Here’s a few hotels for you to check directly which are in a good location to the beach and restaurants and should come in at a decent price: Hotel Myramar, La Jabega apartments, Veramar (self catering) and Hotel Las Piramides. As far as food is concerned, lots of the Spanish restaurants do a great ‘menu del dia’ which is always fantastic value and will include a starter, main and dessert, some will also throw in bread and a drink too. Prices start from as little as €7.50 for a menu del dia but you can pay up to say €20 depending on the restaurant. Tapas bars are a good option especially when you don’t want a large meal at lunch time and its a nice way to sample authentic Spanish food, tapas usually starts at €1.50 up to about €4 each tapas and 2 or 3 with bread to share can be enough for a light bite. The thing about Fuengirola is, you can spend as little or as much as you like, bring a sandwich to the beach during the day and have a menu del dia in the evening and you could get away with spending as little as €40 a day for the both of you. Hope this helps, if you need any more advice please don’t hesitate to contact me again and best of luck with your wedding. Loved reading your post. My partner and I are late 50,s but very young at heart, ha ha. Really not sure what resort is best. We like to walk on a coast road with many stops for beverages – usually alcoholic during the day and. In the evening we like a bit of atmosphere but not rowdy. Some culture would be good too. Where would you recommend. You could always split your time and have a few days in Malaga, here you will find the most culture but also beaches and tons and tons of good bars, many hotels have lovely rooftop bars. Always a favourite pastime of mine when i’m in the city having a Mojito on the top of a hotel rooftop. Nice resort for a good coastal walk with a few stop offs would be my favourite Marbella, otherwise for somewhere a bit cheaper but still lively look at Fuengirola or Benalmadena. They all have a lovely long beachfront paseo lined wit hotels, bars and restaurants, it just depends on your budget. Fuengi being the most reasonable i’d say with Marbella prices being slightly higher. If you do book, consider using my link please, it doesn’t cost you anymore but helps keep my blog going and all the free information and advice I give. thank you, hope this helps. Your blog is really informative, thanks for taking the time to put it together. My wife, 1yr old daughter and I are staying with friends 40 minutes north of Malaga in September. We have hired a car and are hoping to book somewhere along the coast for a 2-3 night stay to break things up. We aren’t keen on the touristy side of things so were hoping to find a reasonably quiet resort with great restaurants and nice beaches. Have you anything in mind? Hi Paul, thanks for reading the post and your comment. September is a lovely time to come to the Costa as many tourists have left and it is still very warm without the scorching midday sun of August. For less touristy resorts you are better of going just East of Malaga to the area known as the Axarquia region where resorts are much less developed than those I mention in my post for example. Some starting points for you to consider would be Torrox, Nerja/Frigiliana and Torre del Mar. The old moorish village of Torrox has a main square with bars and restaurants and narrow side streets to explore, its great because you feel you are in a traditional Spanish pueblo but only 3km from the beaches and all of its amenities. Frigiliana is similar in that its a white washed Spanish village with some very nice restaurants but benefits from being only a few km inland from the toen of Nerja. While Nerja is a tourist destination, its much more low key and laid back than the likes of Benalmadena and Fuengirola. Nerja itself is built around a lovely village overlooking the many beaches to the left and right of the main town, there’s loads of choice for accommodation, food and drinks. We just came back from a weekend in Nerja and have been going there for many years with our young daughter. Torre del Mar is a coastal resort but mainly used by Spanish tourists in summer as its not widely promoted as a tourist destination for the Brits. It has a lovely long stretch of promenade beside wide sandy beach to take walks and pop into many of the beach side restaurants for a bite to eat, the seafood is great. It has a nice atmosphere and the views up to the mountains are of tiny Spanish villages as opposed to huge hotels, although there are some very good hotels in Torre del Mar. There’s a little fishing port (La Caleta de Velez) where you can take a boat trip and do some dolphin watching or just watch the Spanish fishermen go about their day. Hope this gives you somewhere to start your search, if you need anymore help or advice,please let me know. I’d be interested to know where you do book and what you think of your trip to Malaga. Hi Rachael, I must apologise for the late response, I’ve actually just returned from holiday myself. Assume you mean you’ve booked for September of next year? To start with, the weather is usually great that time of year, its still hot with temps in the mid to high 20’s, sometimes hotter so yes the pool will still be warm enough to go swimming in, I think that hotel has an indoor pool too which i assume would be heated. You will see lots of people swimming in the sea also in September and early October. The beach in Torrox is quite stoney but only on the waters edge, the rest of the beach leading down to the shore is nice and sandy and because the temperatures are not so high, the sand doesn’t get too hot so the kids will be able to happily build sandcastles. If you have your heart set on this hotel and don’t want to change the best thing to do is just buy some of the jelly type shoes for the kids feet, you can get them here in the souvenir shops. Its actually a very nice hotel, Ive looked at it myself before for a weekend break, depending on whether you have booked all inclusive or just b&b Torrox is lovely, it has a very nice promenade with lots of beach bars and restaurants and its safe for kids too. You are also not far from the lovely village of Nerja where you can take a day trip and see the caves or just wander round the village, I’m sure the kids will be happiest on the beach and by the pool though by the sounds of it. If there’s anything else I can help with,please let me know. myself and the hubby are looking for a suitable resort between Christmas and New Year. We’re late 30’s and like the idea of jumping on a bus/train and going to different places in the day and returning for drinks / food and to relax in the evening. I’m not sure which resort will be lively (ish) that time of year. Hi and thanks for contacting me. The best place to be around christmas and New year is Malaga itself. It’s busy all year round unlike some of the resorts which are only very seasonal in terms of tourists and things to do. In Malaga you have the benefit of being able to see the gorgeous Christmas lights in Calle Larios, (the main shopping street in the city) and have the best access to the train and bus stations. You can take a bus to pretty Nerja village in around an hour or even hop on the high speed train (AVE) and head up to Cordoba for the day. You can get round Malaga on foot including walking to bus and train stations and if the weather is warm you are also right on the beach but can head into the old town at night where you can find some great restaurants and its usually buzzing this time of year. Loads of cultural things to do in the city too or just enjoy wandering round and taking in the sights, in my ‘Malaga wine’ post I mention a very good bike tour company where you can book various different tours of the city including wine tasting and tapas etc, a very nice way to get to know the city better. If you need help with hotel recommendations come back to me and I’ll be happy to offer some suggestions. I hope this helps. Hi, we are planning a trip to spain in December. We are in our 50’s, relatively good health. Do not want night life, but would like beach, a little space, and maybe a small town environment – where you can walk to a “market” and get fresh veggies, or walk to a good restaurant, or sit and watch the view from your own place. Where would you recommend. Hi Jackie, thanks for your comment. I have been meaning to up date my post with a lovely little town called la Cala de Mijas which is about 30 minutes from Malaga airport by car, it would be perfect for what you are looking for. If you’ve been watching the series lately ‘Playa in Marbella’ Olivia’s restaurant which is featured is actually in la Cala not Marbella as the program would lead you to believe. Don’t let that put you off though as Olivia’s is fairly unique to La Cala, most of the other restaurants and bars are more low key than this, it is a nice place to go for a cocktail however. La Cala is a lovely sea side town with a long wooden boardwalk connecting it to many other beaches and little towns or its good for just a stroll and stopping off at some of the beach bars which line it. La Cala is an all year round type of town and although the population does go up in summer it has a nice feel about it all year with lots of the bars and restaurants still fairly busy. It has a village type feel to it with lots of individual shops, supermarkets and plenty of restaurants as well as the beach all within easy walking so you wouldn’t need a car. There’s a twice weekly market (Wednesday and Saturdays) where you can pick up your fresh veg as well as many other things and you are only 10 minutes in a taxi or bus from the busier town of Fuengirola if you wanted a change of scenery. If you would like more info on accommodation or restaurant recommendations in La Cala, please come back to me, I’ll be happy to point you in the right direction. Your recommendations seem to be really helpful. I wondered where you would recommend mid March for a short break of 5 days for 2 adults? I’ve seen lots on offer to torremolinos and benalmadena but wondered if they would have enough to do? Any advice would be very welcome. Hi Tricia. Thanks for your comment. Mid March most of the coastal resorts are just starting to get ready for the season so you’ll still be able to get some great deals on accommodation at this time of year also lots of the bars and Chiringuitos which have been closed for winter will be starting to re-open, some are open all year of course but you’ll have a bit more choice. It really depends on what you want to do, I would say Benalmadena probably has more to offer but if you are keen walkers, you can actually walk from Benalmadena Marina to Torremolinos along the beach paseo and then up into the main high street area of Torremolinos, its a lovely walk and there’s tons of places to stop off for refreshments along the way. If there’s anything specific you are interested in doing,please let me know and I can guide you further. I should say that a day trip to Malaga is a must, its a really beautiful city and the train will take you into the centre from either resort. My hubby and I have booked flights to Malage for the end of September, for 4 nights and we’re unsure where to stay. We’ve been to Benalmedina & Torremilinos previously with the kids, so know these resorts. We enjoy walking (so walking from one resort to another isn’t a problem), watching the world go by and stopping for a beer and nice food. We like the sound of Nerja, but wondered if we’d be better off just going for a day trip, rather than staying there for 4 nights. Hi Sam, Thanks for your comment. End of September is a great time to come to Malaga, in fact for 4 nights you would have a great time staying in Malaga itself. There is a great city beach with a long paseo for walking and numerous bars and restaurants to stop off for a couple of beers. The food scene is really great in Malaga too, as you can imagine like any city there is every type of cuisine available and of course some of the best tapas around. The city centre, beach and the marina are so close, you could see them all in a day but with 4 days you can really get to know the city. Malaga also has some really cool roof top bars where you can enjoy sundowners or a late night drink after dinner. Nerja is a good choice too and one of my personal favourite places on the CdS, its just so scenic and the coastline very dramatic. The village of Nerja itself is beautiful and great for a wander, but its small and you may get bored. The beach at Burriana is just a short walk away from the centre and has a good choice of restaurants. You could always take the bus up to the white washed village of Frigiliana from Nerja, or for a good walk head to Torrox costa where you can walk along the paseo for miles, Torrox is a lot cheaper than Nerja for food and drinks too. Its a tough choice and it really depends on what you want to do, I would say Nerja would be them more relaxing of the two but there is more to see and do in Malaga…let me know what you decide I’d be interested to know. Hi Steve, thanks for your message. My daughter has just turned 5 so I’m reading your comment with her in mind and thinking of the best family options. You will struggle in Marbella to find a good price apartment I think, especially walking distance to all Marbella has to offer, what time of year are you coming by the way? As I mentioned in my review, Benalmadena is the best choice for families with young kids but not everything is free or cheap but there is lots to do…. Tivoli world, Sea life centre, Selwo Marina and the cable cars or a boat trip from the marina, Paloma park is lovely, and free and of course the beach stretches for miles in Benalmadena. There are usually lots of holiday lets around Paloma park area and from here you are only 5 minutes from the beach too. In general food and drink tends to be cheaper in Benal compared with Marbella and if you really want to go to Marbella, you can take a bus from the main road running through Benalmadena right by the tourist info kiosk and go for the day. There’s also a small ferry boat which runs from Benalmadena and Fuengirola every hour in season, its a nice trip and you can have a few hours in Fuengirola for a change of scenery. In the other direction you could hop on a train from Arroyo de la Miel station and be in Malaga in 30 minutes or take a bus up to the lovely little village of Mijas where the views over the coast are fantastic, the kids will enjoy making their own chocolate bars in the smallest chocolate factory in the world. If you need any more help or advice please come back to me. Hi Amanda, lovely that you and your sister are coming to explore somewhere new together, I’m sure you’ll think Spain is fab! End of August is going to be hotter, busier and more expensive but if you don’t mind crowds and sightseeing in the heat then don’t let me be the one to put you off. End of September is lovely, still hot but not so humid, still busy but with less kids obviously and loads going on as resorts are still in full swing. Honestly the time you come really depends on you and maybe your budget. If you are here the third week of August you might catch the Malaga feria, its a huge festival for Malaga and for a week the city is alive during the day with ladies dressed in flamenco and lots of street parties, by night there is a huge feria (carnival) with rides and casetas (huge tents) where you can party the night away. As for the best place to be based Marbella although fantastic with the coast line, tons of trendy beach bars and restaurants and of course the old town with the orange tree square and a more Spanish feel is maybe a little far out for the places you want to visit. The reason is that the train line finishes at Fuengirola so you would have to take a bus or taxi to any of your day trips if you were staying in Marbella, although from Marbella you can go into Puerto Banus for a meal and if you like to stay out late there are some great bars and clubs which get busy after midnight in Banus. If you choose to stay in Malaga, Benalmadena or Fuengirola you can hop on the train. I mentioned in one of my recent comments to a family looking for a base that Benalmadena is a good option as there’s lots going on with the lovely Puerto Marina which is stunning at night, Benalmadena pueblo and also Mijas Pueblo for day trips or an evening out, both easily reached by local bus then you have fuengirola just a few stops on the train in one direction and Malaga a few stops in the other. You can even get to Fuengirola by boat, they run every hour between Benal and Fuengi during the day. There are loads of tourist offices dotted along the coast and they have coach trips to all of the major tourist spots, Nerja and Gibraltar too so you won’t get bored. Hope that helps, have a look at some of my other posts on my site for ideas on what to do in Mijas and Malaga, there’s also a post on where to see Flamenco and if you need any more advice please come back to me! My husband and I are flying to Costa Del Sol for a 2 day wedding which will be taking place in Cancelada (in Villa Africa). We will be there for 10 days and we are looking for a relaxing holiday close to the beach, being not too far from nice restaurants and a bit of local markets/shopping /culture and anything more local. We are not really fans of crowds of tourists being from London where there are more than enough 🙂 We might have a hire car for at least some of the time but that is yet to be determined. I have looked at Estepona as an option but is that a place you would recommend and of course any others you would say would be somewhere we might enjoy. We are in our late thirties so not totally opposed to fun and some local wine just not the clubbing kind I look forward to hearing from you. Oh I forgot to say that we will be travelling in the middle of May this year. hi Merete, oooh villa Africa is a lovely place for a wedding and the weather mid May is lovely, it can be hot but not unbearable like in July and August. Also in May you won’t find places crowded like in peak season but there’s enough going on and plenty of people around. Just about every town has a weekly market but based on what you are looking for you can’t go wrong with Marbella, its about 20 minutes from the wedding venue and has some great restaurants and bars and the beach and promenade stretches for miles. If you prefer a bit of culture you could stay in the Old Town of Marbella which is only a 5 or 10 minute walk down to the beach and the marina and will give you the chance to explore the more traditional side Marbella has to offer, there’s a great Flamenco venue in the old town and lovely narrow streets to explore with little restaurants around every corner. Estepona is nice too, not as upmarket as Marbella but similar in what it offers in terms of the old town and the beach and marina area. Food and drink tends to be a bit cheaper in Estepona too and you are slightly closer to where the wedding will take place. You mentioned hiring a car for a few days, you could have a day in the mountain village of Rhonda, around an hour or so in land from Marbella. Take a trip into Malaga where you can visit museums and see lots of culture, try some sweet Malaga wine or book a bike tour or tapas tour to get to know the city. You could even break your trip up and have a couple of nights in Malaga when you first arrive as its literally 8km from the airport where you can hop on the train straight into the city centre. I could go on but I think those are your best options, I hope you have a lovely holiday and enjoy the wedding. HI Anna, thank you for a very informative sight. I last stayed in Benalmadena but would like to try somewhere different. I am coming over with my sister in October and we are both in our 50’s. Ideally we would like to stay somewhere that has plenty of attractions, shops/supermarkets and restaurants within walking distance as we won’t have a car. We don’t mind if we stay in a hotel or private self catering but would like a sea view to wake up to every morning as this is one of the best parts of our holiday. What do you recommend? Hi Carrie, thanks for contacting me. What did you think of Benalmadena did you ike it? For a sea view you can’t go wrong with either Fuengirola or Marbella. Lots of sea front hotels in both resorts, Fuengirola being a little cheaper although in October you may get some pretty good deals in Marbella too. In terms of things to do, shops restaurants etc, again both resorts have plenty but Marbella is a bit more upmarket. Both resorts have a nice weekly market and plenty shops, Marbella has both designer and high street as well as little boutique shops especially in the old town. Don’t be put off by me saying its pricey, there are so many restaurants and bars competing, you can find good priced meals and menu del dias (set 3 course menus) around. Both resorts have a lovely long promenade where you can stop for drinks along the way and if you wanted to see other places there are local buses or excursions available to take you wherever you want to go. Hope this helps a little, let me know what you decide. I love the sound of so many of these resorts you have mentioned previously. My partner and I are looking to book and go in May,we are in are early 30’s and want somewhere that’s not full of nightclubs but has a good selection of bars and restaurants. My main problem is that I have a lung condition that limits me walking in very hilly or built up areas,are there any resorts that is easily accessible to the beach and main resort area? I can get a taxi /bus to and from but it’s when I am there I can’t walk up hilly streets etc. Hi Karen. Most of the beach front hotels and promenades are very flat so if you booked somewhere to stay on the beach front you would be fine, saying that I would avoid Nerja as there are too many hills and steep steps for you to venture too far. Benalmadena is also hilly but the main front stretches for miles and is fairly flat with the roads going up hill further into town being slightly hilly. I think your best option would be Fuengirola, its very flat, has a huge paseo lining the beach with tons of bars and restaurants and the area that comes alive at night, known by the locals as ‘fish alley’ is a maze of streets in a type of grid system filled with every type of restaurant, but it is all completely flat and easy to walk to. There’s a great jazz bar called “Speakeasy” in Fuengirola that does great cocktails and fab live music, a weekly market (Tuesdays) and if you come early May there’s a fantastic food festival which takes place on the market ground where food and drink from every country you can think of is celebrated. Another option is Marbella, but there is a slight hill to walk to get up to the old town, its quite gentle and takes no more than 5 minutes from the beach front but I guess only you know what your limitations are, you can’t go to Marbella without a visit to the old town but you could always take a short taxi ride to it from wherever you stay in Marbella. I would absolutely look for accommodation on the beach front to be sure of being on a flat and prices in May are still affordable for beach front accommodation. Hope this helps to answer your question, if you think of anything else or find a hotel you would like to comment on, come back to me. Have a great holiday! Beyond Nerja is not really my area of expertise to be honest so im really unsure of a bike route from Nerja to Granada. I would say its probably the same distance again at least so around 110km or there abouts and once you leave the coastal road at Motril the rest of the route to Granada is heading in-land. Perhaps the specialists at ‘biketomalaga’ will be more help with this one. By the way, 4 nights in Malaga would be lovely, or break it up with 2 nights in Malaga and 2 in Nerja, both favourites of mine. Hope I’ve been some help, happy planning! Great advice for everyone. My wife and I are coming to the Malaga region for 2 weeks in July. We are planning on staying in Marbella for the first week. So we have a more lively week. However, for the second week we would like to go somewhere more traditional (possibly more inland) than the more tourist orientated resorts. We have been looking at places like Ronda and Frigiligana. We are looking to rent a villa with private pool. Will rent a car, but also happy to walk about the resort. Do you have any recommendations on a town that has maintained many of the traditional features, but has enough bars and restaurants to allow us to out for dinner / drinks a few nights? Hi there Allan. I love your idea of breaking up your holiday with a week in Marbella and a week in a more traditional village. While in Marbella, be sure to visit the old town, to see the more traditional side of Marbella, its especially lovely on an evening. For your second week, Ronda or Frigiliana definitely offer what you are looking for in terms of tradition but with plenty bars and restaurants. Ronda is a fair size so offers more and although attracts lots of tourists it is still essentially a traditional Spanish town but with a few more modern bars and restaurants as well as the Spanish offerings. Frigiliana is smaller and much closer to the coast, only about 6km from the pretty village of Nerja which is worth a day trip or a visit one or two evenings for a meal and to feel a nice sea breeze, you will find the inland mountain villages hotter in general than the coastal resorts in July. Frigiliana is beautiful to wander around through the narrow cobbled streets and is very low key although there are still lots of places to eat and drink. Another village worth considering is Benahavis, only about 15km from Marbella north of San Pedro, Benahavis has gained a reputation for its food scene as has many excellent restaurants. Its fairly small but if you are happy spending your days in the villa and coming out on an evening for a bit to eat, Benahavis is a good option. Hope you find what you are looking for and have a great holiday. Thanks for the reply Anna. Will continue to base my searching around Ronda and Frigiliana, and will add Benahavis into the equation. Final question, are there towns around Ronda that you would suggest as a good base, in case I cant find an appropriate property in Ronda itself. Honestly Allan, I’m not sure about towns around Ronda. There’s definitely not much on the approach leading up to Ronda, as you will see if you do decide to go there, It kind of stands alone surrounded by valleys. I’m sure there must be but I would guess they would be small village type dwellings with not much for you to occupy a week. I wouldn’t like to say for definite or advise you on where else you could stay outside of Ronda itself. Thanks that’s definitely cleared that up. Will concentrate within Ronda itself. Thanks again. You’re very welcome, happy holiday planning! Hi Sarah. That’s a tough question and I would say to anyone thinking of moving here on a permanent basis to spend time in resorts they are considering to live in, and by that I mean at least a couple of days, longer even. Also visit resorts you haven’t considered as you might be surprised at what you find. When I first moved to Spain, I lived in Benalmadena Pueblo (village) for 4 years so it will always hold a special place in my heart, i still visit most weekends as we have family living there. There are things about Benal that I love and other things I don’t love quite so much. You say you are fit, that’s good because Benalmadena is very hilly, the Pueblo being at the top with fantastic views from the church grounds overlooking the coast. It is quite diverse in that the Pueblo is charming and traditional and the coast, especially in summer gets very busy attracting people of all ages. The marina development is very nice and from the Marina heading East you can walk along the paseo (beach promenade) all the way to Torremolinos. The paseo stretches for a miles in both directions actually and there are lots of bars and restaurants along the way. The town centre of Benal is up hill slightly but walkeable from the coast and it has all you need without being overwhelming, also Paloma park with its wild rabbits and chickens roaming round is a welcome break from the high rise apartment blocks which surround it. Fuengirola is more flat with everything including the feria ground where there is a weekly market and many festivals are held throughout the year. Town centre of Fuengirola is a stones throw from the beach paseo and offers many shops and restaurants in an area nick named ‘fish alley’ a maze of streets full of restaurants. Just a little further on the outskirts of town, just behind the castle is “Mirimar” a large indoor shoping centre with cinema (some English movies), restaurants and even a Primark! Fuengi is generally a little cheaper for eating out, probably because there are so many places to eat and drink in one place but honestly it would be really hard to choose between the two towns. Have you considered or even heard of La Cala de Mijas, you might know the restaurant featured on TV recently “Olivias”, this is in La Cala. It’s a really lovely, small town but with plenty supermarkets, bars and restaurants, health centre and gym too. La Cala is great because it has an all year round good population whereas some of the bigger tourist towns like Benal and Fuengi can appear a bit quiet out of season, especially at night, it also has a large expat population but still has a Spanish feel. La Cala just has one decent size hotel but none of the high rise apartment blocks like the other places so it appears more laid back and unspoilt. There is a wonderful “Sandero” a wooden walkway built along the beach which stretches a few miles and plans are in place to extend it as far as Fuengirola. Lots for you to think about I hope, please let me know if I can be any more help. Sarah hi again. Just thought I would give you an update to your question. I asked my followers on my face book page on your behalf which they preferred for retirement, Benalmadena or Fuengirola. I’m spending four nights in Malaga in june and was wondering if I’d get a better hotel deal by just turning up and inquiring at hotels rather then booking in advance. Hi Mark. If i were you, I’d absolutely book in advance, you’d be surprised at how quickly hotels get fully booked in Malaga and rather than you wandering from hotel to hotel to be disappointed its worth spending a little time in advance looking at the area you want to be and booking before you arrive. There are also lots of apartment rentals available in great locations (which you wouldn’t know about if you just turned up in the city)if you prefer that type of self catering accommodation rather than a hotel. Hi Angela. How lucky are you to be coming away without the kids, If I got the chance to do the same I wouldn’t want to be surrounded by them either. June is a great time to come as there aren’t as many kids here but the weather is fantastic, hot and sunny! Based on what you’re looking for I would avoid Puerto Banus. Marbella would be a great option for you and your friends though, it has loads of nice bars which get busy on the evening especially on the port. Some have a bit of a club feel t them after midnight but without any entrance fee, hey kind of just pick up the pace a bit. I really like Lemmon on Marbella port for late night drinks and some of the bars surrounding it for drinks earlier on. If your budget will stretch a gorgeous hotel perfect for a girlie trip which is adults only is the Amare beach hote, I would love to stay here myself, its gorgeous, ultra chic and modern and has a fantastic beach and rooftop bar area. I hope that helps a little to narrow your search, let me know if i can do any more to help…happy holiday planning! Very informative and interesting read about the Costa Del Sol. My girlfriend and I are looking to head to the area the first week of October. We are unsure of the area to choose, hopefully you can help? We’re looking for somewhere offering plenty of local Spanish restaurants and bars. We are not looking for clubs and just want somewhere to relax, eat, drink and enjoy the weather. We plan to go to the likes of Ronda, Malaga and Estepona for the day trips. Ideally looking somewhere we can relax by the beach and wander around the rest of the time. Marbella would be a good base for exploring both Ronda and Estepona as day trips and would perhaps make fr a more relaxing base than Malaga which is why I suggested breaking it up. The old town of Marbella is a welcome break from the coast with a lovely Spanish village feel to it, I love to wander round window shopping and having a bite to eat in the evenings in the old town. There are loads of bars to have a quiet-ish drink and watch the world go by along the long coastline of Marbella, there is every type of cuisine you could wish for too with hundreds of restaurants, some casual and some more fine dining so you can really mix it up a bit. You could even hire bikes and cycle all the way to Puerto Banus for the day or take a short 15 minute or so taxi ride. For somewhere a little cheaper but still with plenty to see and do, take a look at Fuengirola or Benalmadena, from either of these towns you can take the bus to the top of the mountains to Mijas Pueblo and spend a nice afternoon exploring this lovely white washed village with amazing views of the coast. Given a choice I would choose Marbella for a weeks stay as a base and if you have time spend a day and a night in Malaga. I am hoping to go towards the end of September beginning of October. It will be my first holiday as solo woman Traveller (42). Where would you recommend to stay. I just want to chill and read through the day but have somewhere to go for a meander and have a nice meal and people watch on an evening without feeling like a gooseberry haha! Also an thoughts on hotels? I would prefer 4/5* with a nice pool area. Any tips greatly appreciated. Hi Helen. Tough question as there are loads of places that come to mind when considering what you are looking for. I have filtered a couple of 4 and 5 star hotels to show whats on offer around Marbella for the end of September for a few days. Depending on your budget really depends on where you stay, the first one on the list the ‘Princesa Playa’ in my opinion is a great price for its fantastic location. Its the quieter side of Marbella port so you could spend the days around the hotel pool reading or on the beach right at the front of the hotel. Then come evening you are just 5 to 10 minutes walk along the promenade to the marina and loads of restaurants and bars. There are hundreds of restaurants lining the front and you could walk for miles before or after dinner. From the port head up into the old town which is lovely at night, sit in orange tree square with your book and enjoy a meal or drink or browse the boutique shops in the old town when you get bored. Possible cheaper options for accommodation but still with plenty of people watching to do at night are Fuengirola, Estepona and to the other side of Malaga, Nerja is a good choice. Many thanks for all the wonderful tips. Getting a bit overwhelmed with it all. One minute i’m thinking Benalmendena, then Malaga iteself, then Estaponia..HELP!! We are 6 ladies between 50 and 75, flying into Malaga end of May. Looking for pretty, beachy, near shops and restaurants, def a beautiful old town to explore. No car so things need to be close. We’ll be staying apartment or villa hopefully with a sea view. Stayed in Alicante this year and loved it but want to try something different. Please help Anna as am going mad looking. Another good option which ticks all your boxes is Marbella, don’t be confused with Puerto Banus and all the clubs etc (think TOWIE). Marbella itself is great for all ages including families, couples, groups like yourselves etc. Stay close to the port of Marbella and you will have wonderful beaches, restaurants and gorgeous Marbella old town all within walking distance. The old town really is so pretty and the main square is lined with hundreds of orange trees and pavement cafes/restaurants under the shade of the trees, venture down the side streets for boutique shopping and ore places to eat/drink. Some more things for you to consider, if you need help with accommodation in any of these places, please get in touch. Thank you so much for going to the trouble of writing such an informative response. I think I am now definitely going to concentrate my villa/apartment search in Marbelle as it seems to tick all the boxes. You are right about my concerns regarding the trendier Puerto Banus; I was thinking that Marbella would be super expensive and akin to PB. So again, many thanks. I’ll let you know how I get on. Glad i could help. The media portray all of these celebs as coming to ‘Mabella’ when in fact all of the bars and clubs they are seen in are all in Puerto Banus which is a good 15 minutes drive away. Just be careful with your accommodation though and make sure to check that you are booking in Marbella rather than Banus. If you use the old town or Marbella port as a guide when looking for places to stay and try to stay close-ish to those then you can’t go wrong. Please keep in touch with what you decide and let me know what you think. So much information, thank you! A girlfriend and I are coming to Malaga mid November, both in our mid 50’s. Enjoy a normal stress free lifestyle but with plenty to see and do. Where would you recommend we stay for 3 nights? No car. Hi Kate, thanks for your message. Mid November can be fairly quiet on the coast, although there are still some tourists about. For a 3 night break in November, Id say Malaga itself would be a great place to stay. Hi Liz, lots of if’s and but’s there as it all depends on your budget, what you like to do and be close to, whether you prefer somewhere busy and lively or quiet. But to the East of Malaga within 30 minutes or so is the quieter towns of Torrox, Rincon de la Victoria and about 40 minutes away is the lovely town of Nerja, one of my favourite places on the CdS. To the West are the more well known towns of Torreolinos, Benamadena and Fuengirola all within 15 to 30 minutes from the airport and all on the coast. Bear in mind that the East tends to be cheaper for property as it is less built up and touristy so if you are on a budget then I’d look there first of all. A real up and coming little town about 35 minutes from the airport is La Cala de Mijas. People who come here tend to fall in love with it as it still has a lot of charm about it but at the same time there’s plenty of great restaurants, beach bars and a lovely long wooden boardwalk joining lots of little resorts together. It’s another fave of mine and the beauty is, if you buy fairly central to La Cala then you don’t need a car as the town has everything you need. If you need guidance on reputable estate agents, please come back to me as its important to buy from reputable people. Also help with short term accommodation while you are here searching for properties I ca help with that too. Any more specific questions, let me know. Thank you for all the information that you’re posting on this website. My wife and I are planning to come to Malaga next summer for about 10 days and I’m researching a location there for our stay. We love to swim in a relatively calm waters at day time in a beautiful, not so crowded beach, and go out to restaurants and entertainment at night. Which resort town do you recommend? Thanks. Thanks for your question. Depending when in summer you are coming, beaches here can get crowded especially at weekends between Malaga and Estepona which is the more touristy west region of Malaga. School summer holidays are the busiest times as you would expect. For more quiet beaches with calm waters you would be better off heading to the East of Malaga to the Axarquia region. Torre del Mar, Rincon de la Victoria, parts of Torrox and Nerja and especially Maro and La Herradura will offer quieter areas to sunbathe and swim than the more popluar resorts like Benalmadena and Marbella for example on the West. Choose carefully though as there are quite a few nudist beaches around. A good idea would be to hire a car and explore the beaches or break up your stay and have a few days to the West of Malaga and a few days to the East. Good luck. hi Caitriona, Oh we love Nerja too and always try to get down there during the spring for a weekend but it’s always good to have a change of scenery. Hmmm, San Pedro is nice. It has a lovely beach front, safe promenade with wide sandy beaches, you can actually walk or cycle to Puerto Banus along the prom from San Pedro, always good for people watching ad spotting the fancy cars and yachts. There are plenty apartment buildings and villas beach side too available for rent and the good thing is its still fairly low rise. The town centre which is just up from the beach front has loads of very nice restaurants to choose fro and a square with a pretty church surrounded by restaurants. If you have kids, the San Pedro Boulevard is fantastic, its a few km’s of different pay parks, great for kids age between 2 and 10. Every 100 metres there is something different to play, zip wires, climbing frames etc and it has a few cafes/restaurants for refreshmets long the way. San Pedro makes for a good base for seeing nearby Marbella or Estepona or even Gibraltar which is only about 45 minutes away in a car. It doesn’t have the charm that Nerja does as its a fairly new and modern town in comparison but its not too built up and the beach and town are very nice. For shopping, San Pedro has some small individual shops but you can get to La Canada, a fantastic indoor shopping centre in around 10 minutes by car/taxi. I hope this helps, if you would like more specific info, please get back in touch. so happy to have read your blog, very informative esp for first timers like us.. we will be traveling with 2 kids (ages 2 & 6) this July 1st week and I’m torn between Torremolinos and Benalmadena… we haven’t booked a place to stay yet, would you recommend going for resort hotels or apartments? Hi. Thanks for reading the post, glad you found it informative. There are so many resorts and hotels on the Costa that It can get quite overwhelming choosing the right place to stay, especially with kids. It’s a tough call between Torremolinos and Benalmadena as both have great long stretches of beach, some nice kid friendly hotels and plenty of activities and things for families to do. But whichever resort you choose, you are only ever a short bus or taxi ride away from the other. If you were to stay around the Puerto Marina area of Benalmadena for example you are just a short walk along the promenade to Torremolinos. Did you see my recent blog post about the new Riu hotel in Torremolionos? My daughter who was 5 at the time and husband and I stayed there last summer and I wrote a detailed and honest report about it. I would recommend this hotel for you as a young family, its new and modern, loads of sun beds, clean, the evening entertainment was good with a mini disco etc early on for the little ones, there are 3 swimming pools and a great splash park both kid would enjoy, oh and a free kids club. Its over the road from the beach too and from here you are not too far from the water park and Crocodile park. Benalmadena probably just edges it for me though to be honest, Paloma park, although too hot to enjoy during the day in July is lovely at night with park cafes/bars open a lake and great play facilities for kids. The town of Benalmadena is quite hilly in places though so be careful if choosing a hotel that isn’t on the beach front as you might have hills to contend with. Tivoli world theme park is a great place to spend an evening and also the marina, as mentioned earlier is great day time for taking a boat trip or evenings for a meal and a stroll. I have put together a hotel search for your week in July. Holiday world, although its pricey it is all inclusive and its fantastic for families. We try to stay here once a year as my daughter loves it, the pools are amazing for kids at this resort and the rooms are spacious apartment style with a kitchen. Bear in mind that’s its actually in the middle of Benal and Fuengirola and you can’t really walk to much ,if that doesn’t bother you then its a great choice. A bit cheaper is Sunset beach, right on the beach too so good location and nice pool area for adults and kids but a little bit of a walk to get to things. The best location and value for money is The Palmasol hotel. Its a few minutes walk to the beach and also the marina which is fantastic and can’t be beaten on location. I hope this has been some help, if you have any other questions please come back to me. Thanks for the great advise. We picked Benalmadena as you suggested and yes it best for family holidays. We really had great time and we would definitely go back there again. Hi there. Thank you so much for taking the time to write a message to tell me you had a lovely family holiday in Benalmadena. It really is the nicest feeling when readers comment to thank me for recommendations!! I give so much ‘free’ information and don’t request anything back from readers, so honestly your comment has made my day and this blog and all the time and energy I put into it worthwhile. Hi, thank you for your information and very full responses. Reading what you have put I feel I am having a change of mind. I was thinking of Benalmadena of Torremolinos but now think perhaps Fuengerola or Marbella. We are 2 couples in mid 50s. Don’t want anything overun with children and whilst we like to spend time on the beach and pool we like to see things as well. Will definitely have a day in Malaga. Not clubbers but like nice food and drinks and live music. An adults only hotel would be good but then not known for hen/stag parties..
hi Janice. Thanks for reading the post and commenting. I can see why you are unsure about where to spend your holiday, there are a few paces that would suit the style of holiday you are looking for actually. You didn’t mention when you are thinking of coming, from end of June until end of August all of the coastal resorts are busy with families with kids. But that doesn’t mean you have to be in the thick of a full blown kids entertainment program day and night. There are adults only hotels along the coast but steer clear of Sisu Hotel in Puerto Banus if you don’t wish to be surrounded by hen and stag parties. The best two adults hotels that immediately come to mind are the Double Tree Hilton which is between Benalmadena and Fuengirola. It’s in a very peaceful location a couple of km’s away from the beach but the hotel offer a shuttle service down to the beach every day. The hotel has one of the best spa’s on the coast, gorgeous outdoor pools and a lovely rooftop bar. It also has tennis and paddle courts and there are at least 4 restaurants within the hotel too. From here you are within easy reach of stunning Mijas pueblo which is just 10 minutes or so by car, or take the local bus, either way you would have a lovely day out exploring. Also not far is Benalmadena Pueblo, fab views from the little church and some very quaint bars and restaurants in the fountain square. I would recommend taking a taxi which is just 5 mins from the hotel and spending a couple of evenings in the Pueblo, El Muro restaurant is lovely next to the church. 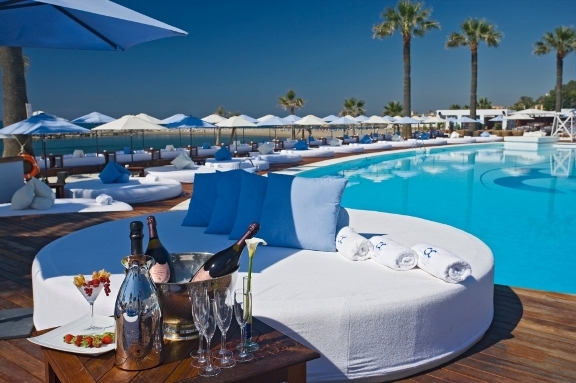 The other hotel is one of my personal favorites, the Amare Beach in Marbella. This hotel is right on the beach, in fact it has its own beach and beach restaurant, one of the nicest places to have lunch in Marbella. The hotel is modern and new and again adult only, it has regular entertainment like flamenco and live music which would suit you and a dj on weekends by the pool. Its not loud and lairy though like some Marbella hotels, more of a laid back vibe. The location is perfect, you can walk to the old town in Marbella which is lovely day or night and also the port, both are just 5 minutes walk. There are bike hire places in Marbella and you can also cycle all the way to puerto Banus along the coast, my daughter and i do this regularly. If you choose Benalmadena, you are closer to Malaga and you can catch the train which is a cheap and easy way to get there. Marbella is probably slightly more expensive in terms of accommodation. Its a tough call…have a closer look at both hotels and come back to me if you need any more info. Hey Bernie. That’s amazing, people like you are the reason I write this blog and spend so much time giving readers my insight. Thank you for sharing this with me, I really mean that, and yes please please tell me all about your holiday and what you thought about Benalmadena after you return. If you need any more info in the mean time, please come back to me. My boyfriend and I will be visiting the area in April for 3-4 days. Having trouble trying to decide where to stay based on all the wonderful info you have given on the different areas. We are in our 30s and are looking to be able to relax and explore as well. We will have a car and are not into the club/party scene. It seems Marbella or Malaga may be the best bet for us but wasn’t sure if you had a better recommendation. Any hotel recs would be great too since it seems like there are so many wonderful places to stay in the mid-price range. Thank you for any advice you can give us! hi Katie. Thanks for reading and posting a question. I would probably agree with you that either Malaga or Marbella would make a great base for your few days here. Malaga has more to keep you interested if you are looking to keep busy, sight see and explore, it has the added bonus of being a city with a beach too. So if the weather is nice the beach makes a welcome break from sightseeing. Many hotels in Malaga have rooftop swimming pools and bars too which are lovely in the evening as the sun sets. The AC Marriot rooftop pool/bar has amazing views especially at night and is a great location to the port beach and city centre. The hotel itself is lovely and would make a great base. There’s loads of lovely traditional Spanish restaurants and tapas bar in Malaga all within walking distance, I mentioned El Pimpi already which is great for lunch. Meson de Cervantes or Vino Mio is nice on an evening especially if you catch the flamenco show at vino mio. If you prefer to stay somewhere a bit more relaxing then Marbella is perfect. My favorite hotel in Marbella is the Amare adult only hotel. I think it would be great for you and your BF too, its adults only but has nice entertainment a lovely pool area and a great beach restaurant. The old town is only a few minutes walk as is the port and you can walk or cycle for miles along the beach paseo stopping at shops, bars and cafes along the way. From Marbella you could reach Malaga in less than an hour in your hire car and spend a day here, or vise versa should you choose to stay in Malaga. Another one of my favourite beach resorts is Nerja, its the other side of Malaga about 45 minute drive. Nerja is a smallish Spanish village built on a cliff, the main focal point is the balcon de europa with stunning views and lot of narrow streets full of shops and quaint restaurants. Spend a day here to get a different feel of the Spanish coast. I hope that helps, if you need any more ideas on hotels, please ask. Thank you Anna for your response! Hi Emma. Thanks for your question. Have you booked your flights yet? If you could tell me when you are coming or thinking of coming I can do the research for you, since the Costa del Sol is a big place and I’ve only really covered the main areas, there may be other that will suit you better. I’ll source a villa that will suit what you’re looking for. Just give me a bit more info like how many people are in your party, dates and a rough idea of budget and whether you prefer to be close to the beach and within walking distance or whether you are planning to hire a car. Thank you Anna! We’re planning on driving (with a couple of stopovers of course! ), so we’ll have our car, we’re thinking of arriving for the villa the first weekend in May for two weeks, we’re a family of four, two adults, a three year old and baby will be nine months. Ideally we’d like three bedrooms so the boys can be separate! As I mentioned our main requirement really is being easy waking distance to some child friendly evening life, restaurants etc! We’re not massively fussed about beach and budget is pretty flexible. Thank you so much! hi Emma. Thanks for getting back to me with some more info. Ive had a look at villas available and to be honest to be close-ish to child friendly evening life, you are better close to the coast even though you say you are not massively fussed about the beach. The coastal resorts tend to be where everything is happening. You may have heard of the little town of La Cala de Mijas?? It’s in the spotlight because of the TV show featuring restaurant ‘Olivia’s’. La Cala would be a great place for you to because your holiday because it’s very child friendly. There are some lovely restaurants ranging from reasonably priced Spanish tapas to a la carte dining, including Olivia’s of course which is actually very child friendly. The beach goes on forever and there’s a fantastic boardwalk where you can take a stroll with the boys and stop at the beach cafes along the way. La Cala has supermarkets, banks, shops and a great outdoor play park with a cafe and lots of open space to play. There are also some pay areas along the beach too with plenty places to eat on an evening, all of which are quite bustly and family friendly. La Cala is great because it still has a kind of village feel to it, there’s only 1 biggish hotel, everything else is really low rise and the coastline here is lined with villas as opposed to huge tower blocks. I’ve found a villa for your dates, it might not be ideal as it doesn’t have a pool, but it has a lovely big enclosed garden and it’s beach front so you could park up your car and walk to everything, its in a perfect spot and not badly priced either. Let me know what you think and if you do book and need recommendations for restaurants that are child friendly, let me know. What a fantastic blog!! We’re two couples 45/55 in age. We’re looking for a nice hotel – not too many children please!! We’re going for Christmas 21-29 December and I have spent an age trawling areas and hotels. Torremolinos/Benalmadena or Marbella?? We like shopping, good restaurants, nice bars, sunshine, promenades, marinas. What we’re after is rest and relaxation in a nice hotel in a slightly more upmarket area without it costing the earth!! I’ve looked at Riu Nautilus and various hotels in Marbella. As a bench mark one of our favourite holiday destinations is Costa Adeje. Thanks for your guidance!! hi Tracey. Thanks so much for your kind words. Hmmm to me it would appear the best location based on what you have described is Marbella. Everyone assumes it’s really expensive to stay and eat out in Marbella but it really doesn’t have to be. I’ve never been to the Costa Adeje actually so can’t really compare. It ticks all your boxes in terms of shopping, restaurants, bars, promenades, marina and of course sunshine and its a bit more upmarket than some other resorts. I have a great aparthotel that I recommend first of all. It’s the Princessa Playa, its on the beach front and therefore right on the promenade which you can walk or cycle (there are cycle rent places close by) for miles, in fact all the way to Puerto Banus if you are fit enough. To get to Marbella port or Marbella old town it will take you 5 minutes on foot and while this isn’t adults only, there would not be many kids at this time of year. I’ve pricd it for yu on your dates and it comes in at less than €500 per couple. Its a shame the Amare adult only hotel isn’t open during the winter as that is fabulous…but anyway, another good option and just a few minutes away from the port again and old town is the Fuerte hotel. It offers a little bit more than the Princessa playa and that’s reflected in the price but it is still not bad at just over €1000 for your 8 days. Both are surrounded by shops, restaurants and bars and as mentioned a short walk to the lovely old town too. I really hope that helps narrow down your search a little, please come back to me if i can help any further. Many thanks for coming back to me with so much information. I actually made a decision a couple of days before your reply and … went for Marbella for and the Fuerte Marbella – 8 nights half board and a room with a front sea view – glad I did when I read your email!! One thing you may be able to help me with – my husband wants a traditional English Christmas lunch on Christmas Day – yes I know!!!?? We’d like to go to Puerto Banus ideally somewhere with a view of the marina. I’m currently looking at Sloanes Bistro but unsure. We want a nice position good food not ludicrously priced. Also when restaurants state “open bar” is this as we know it and what drinks are included? Many thanks for your help – your blog is wonderful!! Ohhh wow, great minds hey haha!! Glad you have something booked, now the planning is the fun part. I was in Marbella for the weekend actually for our wedding anniversary, our hotel was the Amare which I mentioned is lovely (we were child free for a night). We walked past both the Princesa and the Fuerte several times and the Fuerte is definitely nicer so you’ve made a good choice. I’m actually with your husband there by the way, got to have an English Christmas dinner on Christmas day no matter where you are in the world. Im a little confused though as the only Sloanes Bistro I know is in Elviria which is in the opposite direction, heading back towards the airport, is that the restaurant you mean? Gran Gatsby has just about the best panoramic views over the port of Banus. They do serve Christmas lunch as far as i know but i don’t know how much it would be, worth contacting them as its a fab restaurant. If the weather is good you can dine outside here too. If i can think of any others ill get back to you Tracey. I would assume ‘open bar’ would mean the price you pay includes unlimited alcohol but check their policy to be sure. I’ve enjoyed reading your blog and wonder if you could answer a couple of questions please? I’m looking to go away for my 30th birthday on a very rare kid free few days! My boyfriend suggested the Costa del Sol but I was hesitant as I always assumed it was the Spanish version of Skegness. Your blog has turned that around somewhat, but could you recommend an area and hotel at all? My boyfriend likes being near a Marina, and I’d be looking for a hotel with a decent pool, perhaps one that attracts adults mostly as we won’t be taking children. I thought Nerja sounded lovely but I’m really not sure. Our budget is modest. Any advice would be greatly appreciated! hi Zoe. Thanks for the comment, sorry for the slightly delayed reply, just had my family over for a visit. 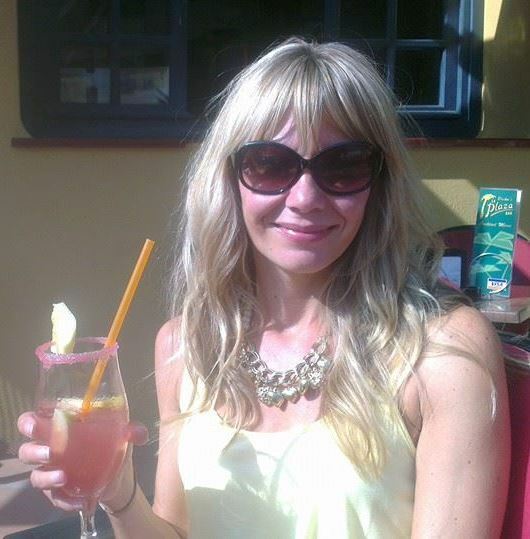 How nice you are going away somewhere lovely to celebrate your 30th, especially child free, the Costa del Sol would be a great place. There are lots of lovely marinas dotted along the coast, some busier and more commercial than others depending on what you are looking for. Nerja is gorgeous and very picturesque because of how it is built all along a cliff edge with little beach coves. The village itself is a pretty little whitewashed maze of streets with some great restaurants, bars and shops too. I would absolutey recommend a couple of days here with your other half. Hotels in Nerja can be a bit pricey though, my favourite is Hotel Carabeo, its a boutique style with a lovely pool area i a quiet location right on the sea front but within a few mins walk to everything. Even if you don’t stay here is recommend having dinner in the restaurant one night. Hotel Villa flamenca is also nice and has just had a refurb and is in a great location close to the burriana beach which is also a good place to walk to on an evening as there are many restaurants and bars down at this beach, it makes a change from the village centre, we always try to stay close to Burriana when we go to Nerja. There isn’t a marina in Nerja so if he’s really set on being close to one I’d look at Marbella or Benalmadena. A really affordable hotel close to the marina in Marbella and also on the sea front is the Princesa Playa. They do happy hour cocktails for 5 euros every day so definitely not expensive!! I’ve been reading your site for a while now as my wife’s folks have a house in Benalmadena Pueblo and it’s really handy and well researched. So when I was told that the Series I produce in Benidorm was moving to the Costa del Sol and would take in everything from Malaga to Marbella and up into the mountains one of the first places we came was to the website and it seem you are the person with all the knowledge. So I just wanted to say hello and ask would you mind having a chat with us about the show, whether to point us in the right direction or maybe take part? Hi Bob. Thanks so much for reaching out and also reading some of my posts, appreciate the kind comments. I heard about the TV show coming to the CdS and actually mentioned it to my social media followers, many of whom are expats like me so are ideal candidates. I’m pretty sure there would be plenty of them looking to be a part of the show. I see you have sent me a private message too so I will respond to that and we can discuss further. Hi Ganesh. Thanks for the message, I’m glad you’ve found my blog helpful so far. You’re right, where to go on the Costa del Sol ca be a bit overwhelming for first timers especially at Christmas time when you want everything to be perfect. I would absolutely suggest staying in Malaga city itself but NOT on christmas eve or Christmas day. The reason – most bars and restaurants will close mid afternoon christmas eve and will stay closed until 26th December. Think of it as similar to the UK where christmas day moslty people visit eachother at home. If you book a hotel with a restaurat i would assume that will be open xmas eve/day but worth checking with them first. Some beach front cafes and restaurants remain open however but i would definitely recommend a ‘resort’ for christmas eve/day instead…ill come to that in a while. A good time to stay in Malaga would be the build up to Christmas, you could get the train straight from airport on 20th into Malaga, it takes just a few minutes. Calle Larios has the most amazing light show to music every night and plaza constitution have evening entertainment. There are christmas markets around the city and lots of nativity scenes. The huge department store El Corte ingles have a lovely gourmet food market on their roof top and an ice skating rink and toboggan rides outside. Also the marina area is buzzing with lots of festive goings on to get you in the mood too. Ive done a hotel search for you for two nights in Malaga city from 20th December, from the list my top pics would be: Petit plaza (a stones thrw from calle larios xmas lights). AC Marriott (views of marina from rooftop bar) Vincci selecion Posada (lovely jazz bar) Molina Lario (opposite the stunning cathedral) Room mate Valeria (bang central to marina and city). ALL of these recommendations are walkable from train station and to all the attractions. You mentioned you like walking, have you considered heading in land for a day or two and walking the Camino del Rey? I did it last December and it should be on everyone’s bucket list IMO. You could get there by train in 45 minutes and either stay over at La Garganta hotel or do the walk then head back to the city all in one day. For Christmas day Consider a beachfront hotel in Marbella (dont confuse marbella with puerto banus). Lots of hotels and restaurants will be offering a traditional Christmas meal and the promenade and old tow of Marbella offer lovely walks with tons of places to stop for food and drinks. There are various bike hire places along the prom too. In this hotel search The hotel fuerte is a great location and lovely hotel, for a much cheaper price and equally good location is hotel princesa playa. Nerja you mentioned is one of my fave places on the CdS. youd have to hire a car or look into a bus from Malaga to get to Nerja. There’s various things going on over christmas on the balcon de europa and the hotel balcon also do a lovely christmas feast and party o the night of 25th. It’s not at all badly priced for 3 nights over christmas too! For other options, also look at La Carihuela beachfront hotels, you can walk into Torremolinos one direction and Benalmadena puerto marina in the other. Lots of bars and restaurants remain open in this area over xmas. I hope this helps you decide a little, I’d genuinely love you to tell me what you decide and where you stay, please keep in touch and i hope you have a wonderful time. Thanks a million Anna. This is brilliant. I have been stressing about this for the last few days and now I have a beautiful picture. I have decided on the Gran Melia Don Pepe in Marbella and the balcon de europa in Nerja. I will choose one among the few you mentioned for Malaga. So we will spend the 21st and 22nd in Malaga and move to Marbella/Nerja from the 23rd. So Im thinking we will do 23 and 24 in Marbella and 25 and 26 in Nerja. Do you think this will work well or should it be the other way round.? Cant thank you enough once again..!! Since we are flying in and out of Malaga airport. We have decided to spend a couple of days in Malaga – the day after we fly in and the day before we fly out. Booked one day in the Vincci and booked the other day in the Petit palace plaza. Im planning to do the Caminito del rey walk in one of those days. (Looking at Slots). We have decided on Marbella for 2 nights – 22nd and 23rd. The Fuerte hotel was not available and we have have booked in the Gran Melia Don Pepe. I have taken your word on Christmas in Neja..! We are spending christmas eve and Christmas day in Nerja on the Balcon De Europa..). Then onwards to Malaga on 26th (see Calle larios) and board the plane back. We have the satisfaction of feeling satisfied about our plans and counting the days thanks to you..! You have been a god-send and we will definitely stay in touch. Thank you once again Anna. Ganesh, I’m sorry I didn’t see your other message until now, they have both come through at once so it seems. Well anyway you have everything firmly in place and it all sounds fantastic, 3 of my favourite places for sure. I have never stayed in the Melia Don Pepe but I hear it is lovely and has a indoor pool and spa too which will be perfect for cooler weather, let’s hope it’s hot and sunny though! Please let me know what you think on your return of all the places, especially Christmas at the Balcon. By the way, a nice restaurant to try on christmas eve for lunch or dinner if it’s open is the Restaurant 34 inside the Hotel Carabeo, its just around the corner from the balcon and is one of my faves. I’m so happy I could help, please keep in touch and let me know if you need anything else at all. By the way, if you still need to book some of your hotels, could i ask if you would consider using the links i included on the previous reply to booking.com. It doesn’t cost you anymore but I have an agreement with them that any customers i send their way, they help fund my coffee addiction haha. I enjoyed reading through your post and reading the comments. My wife and myself are contemplating retiring to the area. We are planning on traveling to the Costa del Sol in March of 2019 for the sole purpose of checking out different towns. We both love the ocean and beach though do not enjoy the hustle and bustle of a large tourist area. I was wondering if you could recommend some quiet, quaint towns either on the ocean or close to it that would be great to live in. We would be looking first at long term rentals with a rough monthly rental budget of 1,800 euro. Any information you could supply would be greatly appreciated. Hi James. Thanks for your message. I’d agree that long term rental first is the ideal way to go, many people i know including myself have lived in 3 or 4 different properties, towns etc until they found the right place for them. With your budget you’ll easily find a nice 3 or 4 bed villa with a pool probably or a luxurious penthouse apartment with sea views. Regarding places that tick the boxes, I would suggest La Cala de Mijas, around 30 minutes West of Malaga between Fuengirola and Marbella. It’s a lovey village with a long seafront boardwalk and the sea front is very low rise apart from just 1 hotel, there are many villas or low rise apartment buildings. There are lots of restaurants, bars, banks, supermarkets, twice weekly market etc, basically all you need but without feeling like yu are in a built up tourist resort. Ive done a search here for you for a few days next march on places to stay to get a feel for the area, Dream gardens would be a nice base, and the VIK hotel is seafront. Other areas to look at would be to the East of Malaga, like Rincon de a Victoria or Torrox costa. The coastline to the East is quieter, a little more Spanish and cheaper than places to the West. Also Nerja is beautiful but can feel touristy especially in summer. If you do book, please consider using my link to booking.com. It does’t cost you any more but i have an agreement with them which helps fund my coffee addiction if i pass people their way. hi Brian. Thanks for your message. Im actually steering towards Marbella for a base to stay. The reason is it has some great beaches, good night life for the girls but also some much more relaxed bars and restaurants which might suit you and your wife. The bars in the port of Marbella would actually appeal to all of you, there are soem nice places to go for afternoon or evening drinks then come midnight the couples and families tend to head back to their hotel and the area is busy with a younger crowd. Lemmon bar is great late into the early hours. The promenade along marbella stretches for miles towards banus and there’s a real mix of restaurants and bars. Also the Old town has some amazing restaurants like Zoizoi and Casa Tua, and its lovely for an evening stroll before or after diner. If the girls want to they can easily taxi into Puerto Banus for a real party atmosphere, worth checking out some of the places to eat front line port too for lunch or dinner. Ive done a search on hotels fr 4 adults and one that I can recommend as I stayed here for my wedding anniversary is the adults only Amare beach. It would suit all 4 of you as it has a nice pool, great beach bar/restaurant and a really modern decor. Also look at the hotel Fuerte Marbella, both of these hotels are really close to the port and the old town and have direct beach access too. Hi Anna, I’m seeking an advice. I’m planning to go to Costa Del Sol by the end of September and I’m not sure which resort to choose. We’re looking for a beautiful beach, not too much of night life, and no crowds. I was thinking of Marbella or Torremolinos? Please advice. Thank you! J.
hi there. I would suggest Marbella over Torremolinos although it depends on your budget. Torremolinos is generally speaking a little cheaper for accommodation as well as eats and drinks when you get there. There are quite a few All inclusive hotels in Torremolinos however right on the beach front which can help you budget. A nice area of Torremolinos worth looking at is La Carihuela, its bustly but not crowded and there are some nice hotels there close to the beach, the MS Amaragua is really good and a stones throw from all of the bars and restaurants and also beach of La Carihuela. The chiringuitos are very good in this area too, seafood and paellas are their speciality and yu can pick up a nice Mojito for around €6. Marbella has a lovely long stretch f beach (as does Torremolinos) and there are tons of restaurants and bars lining the promenade as well as the old town which has a very different more authentic feel to it. Best times to see the old town are for a morning coffee/stroll and in the evening when you have a choice of some wonderful restaurants and boutique style shops, Casa Tua is my personal favourite placce to eat in the Old Town. Marbella is quite busy but you can avoid crowds of people quite easily as there is so much choice and there is always a quite beach away from the main port area. I have done a search based on 2 sharing a hotel at the end of September for a week in Marbella. For a great hotel in a good location but for a limited budget i recommend from the list Princessa playa, if you can stretch a bit more than Hotel Fuerte is lovely, for a real treat go for the Amare or Gran melia Don pepe. If you do book, please consider using my links as it doesn’t cost you anymore but helps keep my blog and all the free info i provide going. Thank you. Great site and info, thanks. What would you recommend for us in mid June, first time to Costa Del Sol region: Mid 50’s couple, accom near beach, nice walks with bars/ restaurants, not too busy, nice pool/ small private pool ? Assuming you read the whole article, as mentioned Torremolinos is great for seafood and beach restaurants, Fuengirola great if you are on a tight budget and Marbella is perfect for couples of any age. Accommodation near to the beach very reasonably priced is The princessa playa hotel in Marbella, I have done a search for mid june for 2 people based on 1 week and there are lots of great hotels. Depending on your budget of course but the princessa playa is a good option, as is the Amare which is adults only but a bit more expensive. Also read more of my replies to comments below as lots of info has been given about the resorts in great detail rather than repeat it again. Please consider using my link if you do book as it helps me give all of this free information to my readers. Thanks for your question, enjoy the Costa del Sol. hi there. Thanks for your question, it can be quite overwhelming looking at all the different hotel choices along the coast from Malaga if you’ve never been before. How nice though a few days away just you and the hubby for your 40th…there are tons of places i could recommend for a super relaxing break so i’ll do my best to narrow them down. First off, did you see my blog post on hotels in Marbella? There are 3 gorgeous luxury hotels featured in the guide, take a look at the post, my top picks from the two would be Hotel Claude and La Villa Marbella. The reason is that they are both in the centre of the beautiful Old Town which I would say is one of the nicest places you can stay for your birthday celebrataion away from the kids. There are some amazing restaurants in the Old Town (Casa Tua is my fave) and its just gorgeous on a summer’s night walking around the little streets. Also from the Old Town you are only 5 minutes walk down to Marbella port/beaches and lovely long promenade. But….neither of these hotels have a pool, so for something lovely, adults only and right on the beach I would agree the Amare is a top choice. I stayed here with my husband for our wedding anniversary last year and we both loved it. The whole hotel has a great vibe without being too busy, however we were there early in the summer season when it wasn’t so busy. You have to expect though everywhere in August will be very busy. Also consider Hotel Fuerte, just a few steps from the Amare and also very nice…both hotels are a few mins from the port and the Old Town and are beach front so really can’t be beaten on location. For a real taste of luxury if your budget will stretch then take a look at the fantastic Puente Romano Hotel, i cannot tell you how lovely this hotel is, its like a little village on the beach but its pricey lol. The Plaza within the grounds is worth going to one evening for a special meal at the Sea Grill or Nobu or just for a drink in the Plaza. The Don Carlos by the way is also a stunning hotel and is where the famous Nikki Beach Marbella takes place every summer, it about 10km away from Marbella centre though and although is on a beautiful stretch of beach with some other restaurants and bars around, there is not as much choice as in Marbella itself, still plenty to keep you going though and some fab beach bars very close by too for daytime dining and cocktails. All of the links i have given you by the way are for a double room for 5 nights in August so the prices you see when clicking the links are correct. Also if you do book, could i ask that you consider using one of my links. It doesn’t cost you any more but i have an agreement with booking.com which helps to fund my coffee addiction here in Spain with a small commission for all the help and advice i give my readers. Thanks for your message. Well it all depends on which routes you plan to cycle as these three routes are quite a way from eachother, Villanueva and Benamacorra are around an hour away by car. If you plan to do the Puerto del Leon route which starts in Malaga city centre then it makes sense to stay there. Also there are a few very good bike rental shops in the city centre, most of which can organise guided routes or will advise you on routes you can do alone if you prefer. Bike2malaga is one place that comes to mind. Based on this search of hotels in Malaga centre i have done for you, my top picks would be Room Mate Valeria, perfect location and with a lovely rooftop bar and terrace for a nice cool drink after a day cycling. Gran Hotel mirimar is just beautiful, but it is quite pricey. I also love the AC Malaga Palacio hotel, one of the best views of the port from the rooftop terrace and pool here. I hope you find the right place to stay, if you do book, please consider using my link above. It won’t cost you anymore but it will help fund my coffee addiction here in Spain which gives me the inspiration for this little blog of mine.